Most physically verified and sealed vault compartments have been re-opened, for which the auditor can provide no valid explanation. Auditing personnel has proven to be utterly incompetent and did not follow the auditing policies and procedures. Repeatedly metal has been excluded from verifications. Many of the audit and assay documents have been destroyed. The US government goes to great lengths in withholding information and spreading false information. In conclusion, the audits have been executed with an inadequate degree of integrity. The heart of this investigation are the sealed compartments that store the vast majority of the US’ official gold reserves. These compartments are located inside the vault rooms of three US Mint repositories; Denver, Fort Knox and West-Point. In the early 1970s when it was decided all the gold was to be physically verified, the protocol was designed to open, audit, close and seal all compartments once, in order to avoid the necessity to repeat these procedures. Despite these rules, my research points out nearly all compartments have been re-opened after being audited. These revelations prompt strong skepticism about the credibility of the audits. Possibly, up to 200 million ounces (± 6,200 tonnes) of gold, approximately 75 percent of the total, have inadvertently been exposed to external threats. What follows is an extensive dossier with most of the information in my possession about the audits, accompanied by a critical analysis hereof. This is a story about misconduct, deceit, inconsistencies, and loose ends. At risk is the safety of the gold meant to underpin the world reserve currency. Hardly anybody in the world of finance is aware of the audits of the US’ official gold reserves. On February 11, 2017, the Financial Times wrote, ‘much of the world’s excavated gold is thought to be in Fort Knox, but nobody can be sure, since the US government will not allow the auditors in’. 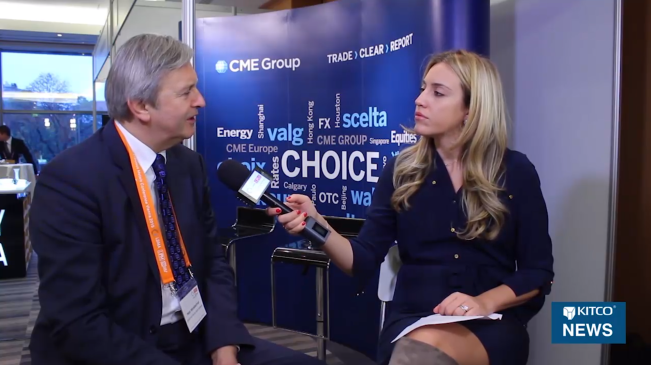 Printed in other media, even the most seasoned gold analysts assess that the gold has never been audited. This is not a subject only the mainstream media is oblivious about, it seems everyone is. Our first observation is that the US government has not been willing to openly discuss the inspections, let alone flaunt with the results. I became aware of the audits through the congressional hearing of The Gold Transparency Act (not enacted) that was initiated by Ron Paul in 2011. Through the hearing I learned that currently the Department of the Treasury’s Office of Inspector General (OIG) and KPMG are responsible for the audits of the US’ monetary gold. Eric M. Thorson representing the OIG attended the hearing and testified under oath it had completed all of its auditing duties by 2008. 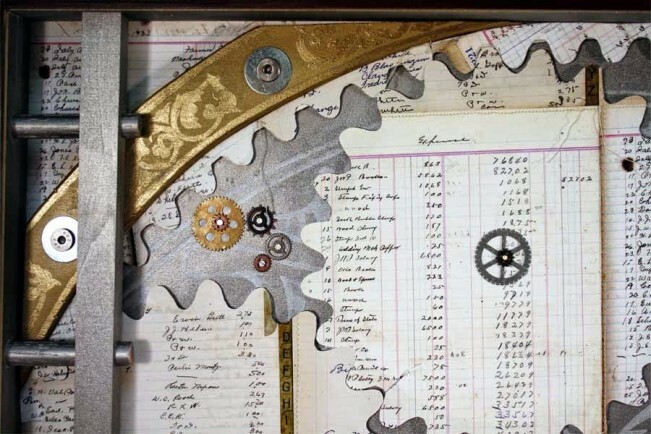 Before we dive into the analysis and address the problems regarding the audits, first we’ll need to lay out the foundation by establishing what part of the US’ monetary gold stock is stored where and has been audited by whom. In December 2017, the US’ official gold reserves accounted for 261,498,926 fine troy ounces (8,134 metric tonnes) all lawfully owned by the US Treasury – though the real owners are the American people. The majority of the total, 248,046,116 troy ounces (7,715 tonnes), is being safeguarded by the US Mint, the remaining 13,452,811 ounces (418 tonnes) are stored at the Federal Reserve Bank of New York (FRBNY). The gold held at the Mint, in turn, can be divided in two segments: 245,262,897 ounces (7,629 tonnes) in Deep Storage gold and 2,783,219 ounces (87 tonnes) in Working Stock. My investigation is primarily focused on Deep Storage metal, which are assets owned by the Treasury and kept under Official Joint Seal (OJS) at the US Mint. Currently in use are three Mint depositories. An aggregated 43,853,707 ounces (1,364 tonnes) are carried in 16 sealed compartments at the Denver depository, 147,341,858 ounces (4,583 tonnes) are harboured in 15 sealed compartments at Fort Knox, and 54,067,331 ounces (1,682 tonnes) are stored in 11 sealed compartments at West Point. Deep Storage Assets. Deep Storage Assets are those assets owned by the Department of the Treasury and stored under OJS at the United States Mint. These assets are reported as Custodial Assets in the United States Mint’s annual Financial Statements. 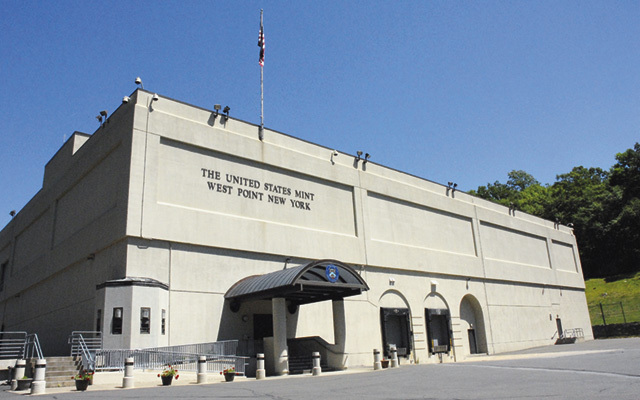 The Working Stock in bars, blanks, and finished coins is stored predominantly at West-Point but outside sealed compartments. Exhibit 2. Source. For a detailed overview on how much bullion and coins is located at what depository in the US in 2017, I’ve uploaded an excel sheet to be viewed and downloaded from here. 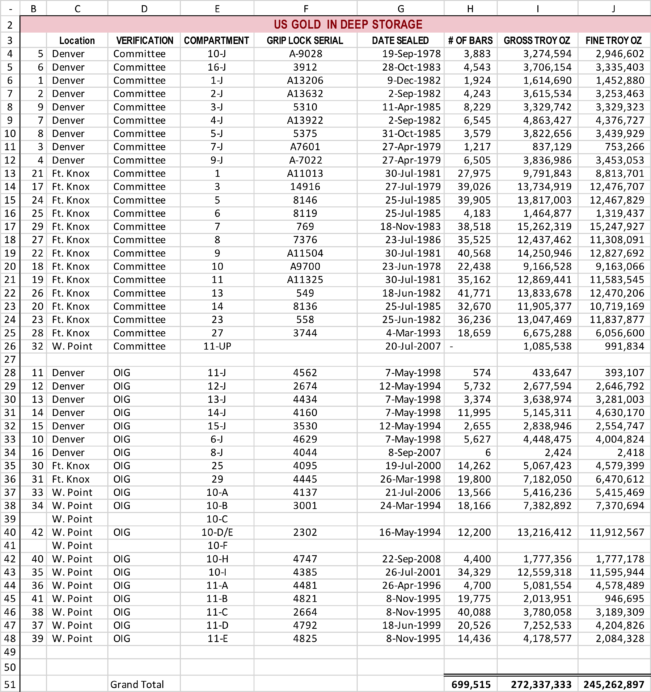 For a more precise sheet from 2001, which includes the disposition of the Working Stock at the time, click here (source). Since 2001 the Deep Storage gold has remained flat, the Working Stock has slightly declined. 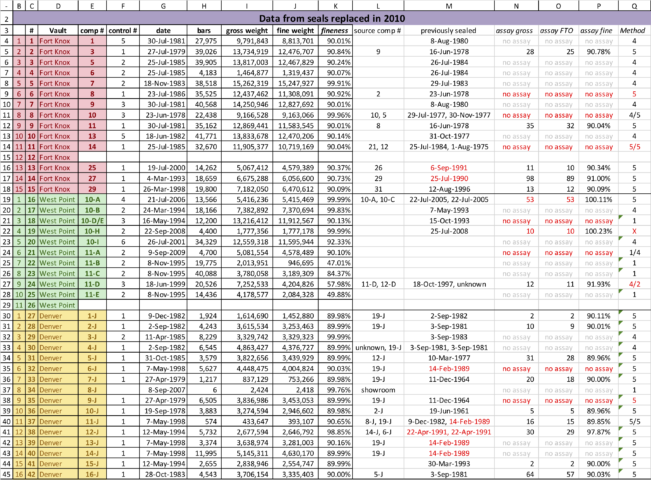 The bar list of the Deep Storage gold in an excel sheet can be downloaded from here, for the bar list of the US’ gold at the FRBNY in PDF form see this document starting at page 128. Ownership of the US official gold reserves was handed over from the Federal Reserve to the US Treasury in 1934. 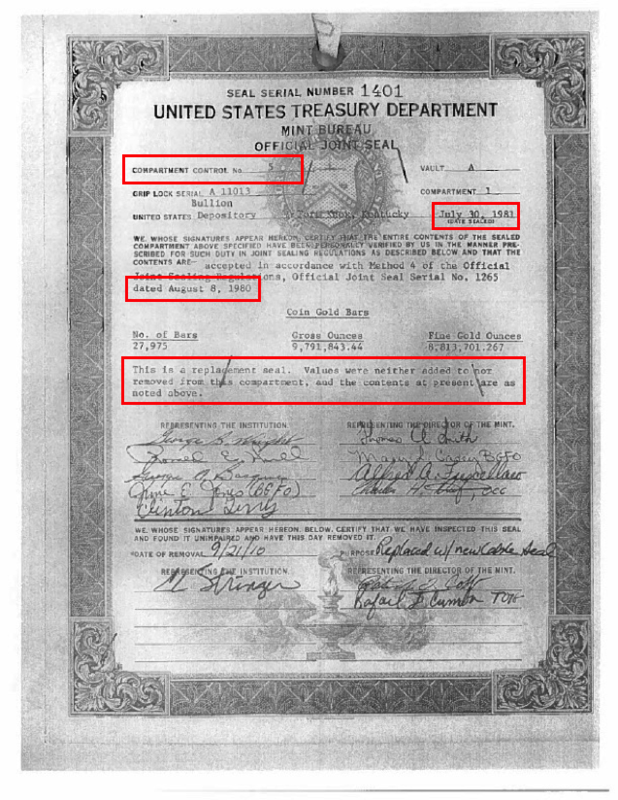 In return, the Federal Reserve received gold certificates to place on its balance sheet. 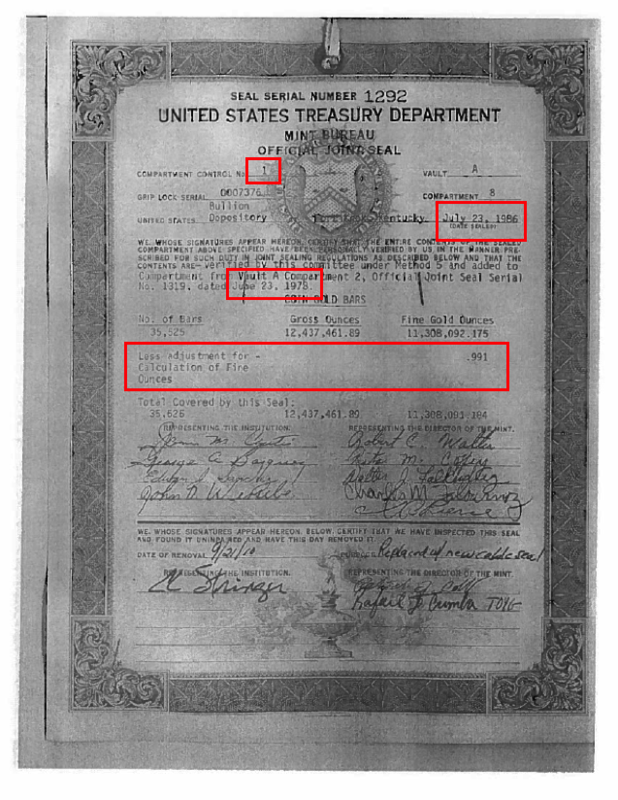 At the time of writing these certificates on the Fed’s balance sheet are still valued at $42.2222 per troy ounce, a statutory value set in 1973. 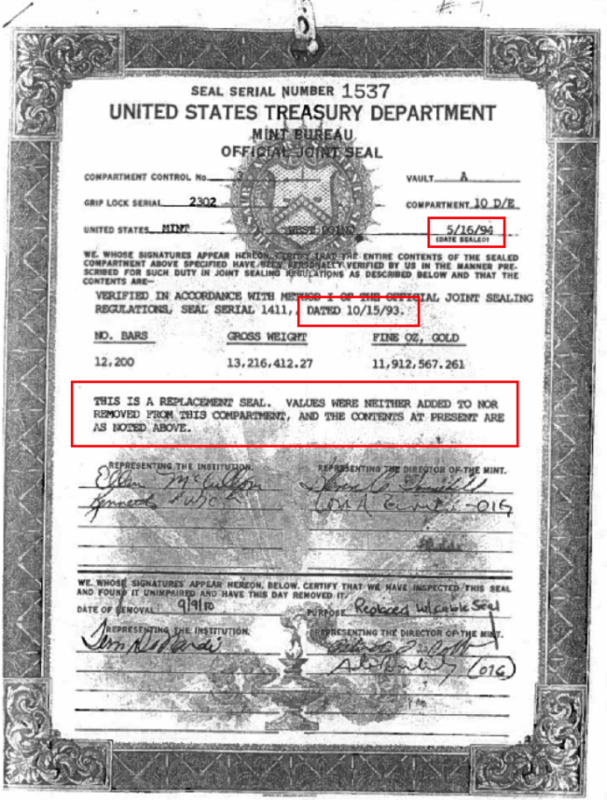 The certificates are redeemable for dollars at the statutory value, not for physical metal. Kindly note the US official gold reserves were higher a few decades ago and spread over different locations, although after 1934 the main custodians have always been the Mint and the FRBNY. Exhibit 4. Source one (page 5) source two (page 35). Please be aware, in some documents the gold in the Exchange Stabilization Fund (ESF) is not included in the US official gold reserves. Provided with background knowledge of the fine weight and whereabouts of the US’ monetary gold stock, we’ll move on to make acquaintance with the auditing procedures. 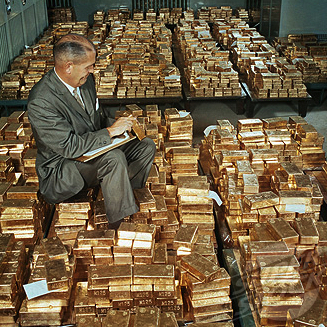 In 1974 in response to congressional interest a commission led by the Government Accountability Office (GAO) physically inventoried, weighed and assayed 31.1 million ounces (967 tonnes) of the gold at the Mint’s largest storage facility Fort Knox. Exhibit 6. Behind one of the massive vault doors of Fort Knox, inside the vault room gold is stored in compartments that are covered by a seal. Note, there are 3 connections to the Fort Knox vault room: the front door, the back door and a tunnel. 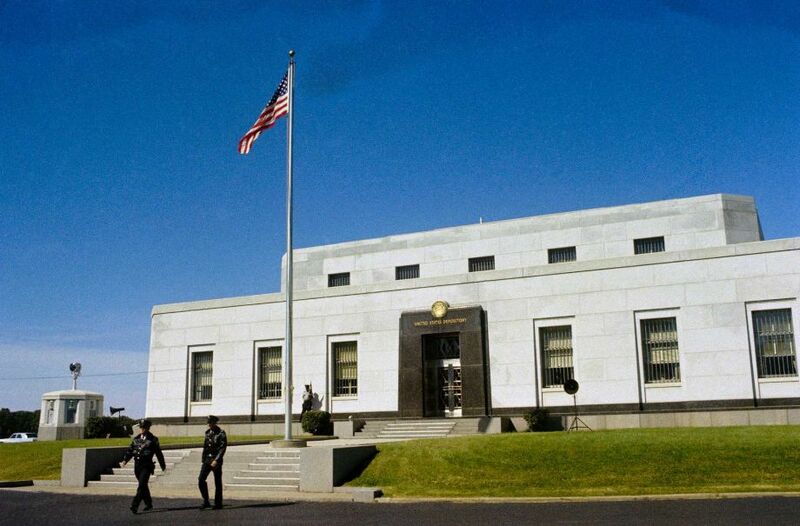 As at the start of the audit process on September 23, 1974, roughly one hundred journalists and nine members of Congress were allowed entrance to Fort Knox, this event is often cited in the media as the last audit of the US’ gold. Factually September 23, 1974, was a non-event: only one vault compartment was opened that day and unqualified people, journalists and members of Congress, looking at yellow bricks will not pass as an audit. What happened the subsequent months and years is far more important, but these events have never been covered by the media. In 1975 the US Treasury agreed to ‘a recommendation by the GAO’ on a ‘periodic, cyclical inventory’ to ‘ensure that about 10 percent of the gold’ was physically inspected annually, eventually to have audited ‘all the gold for which the US government is accountable’ ‘by 1984’. Every compartment physically verified was placed under Official Joint Seal so to ‘avoid the necessity of verifying all assets in each audit’. 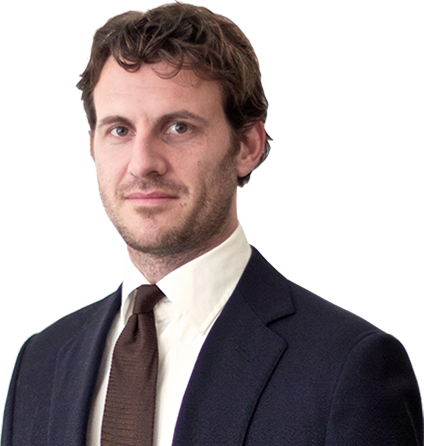 ‘These actions, having once been performed … in accordance with established procedures, will not have to be repeated as long as the assets verified remain under an unimpaired joint seal’. Exhibit 7. Source: US Mint annual report 1975. Exhibit 8. 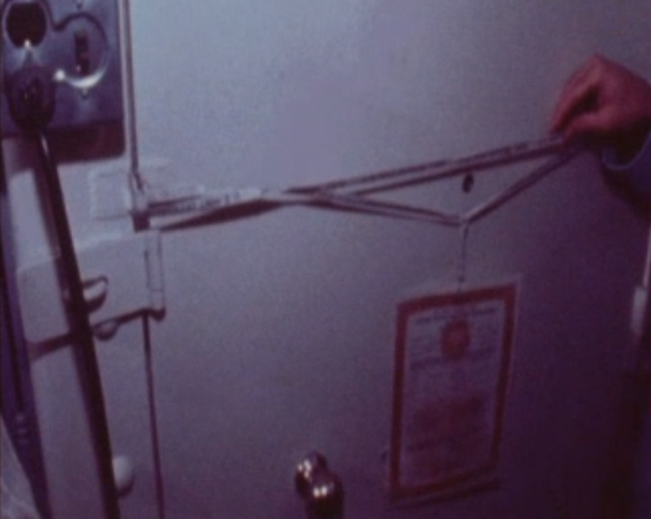 Compartment at Fort Knox (1974) closed by a cloth ribbon waxed to a seal. The compartment cannot be accessed without breaking the seal. The program that started in 1975 was dubbed the ‘Continuing Audits of United States Government-Owned Gold’ (Treasury Order No. 234-1) and was executed by ‘the Committee for Continuing Audits, headed by the Audit Staff of the Treasury’s Bureau of Government Financial Operations (BGFO) and included the Chief of Internal Audit of the Mint and the Assistant General Auditor of the Federal Reserve Bank of New York’. Although the GAO was ‘invited to participate in all audits’. 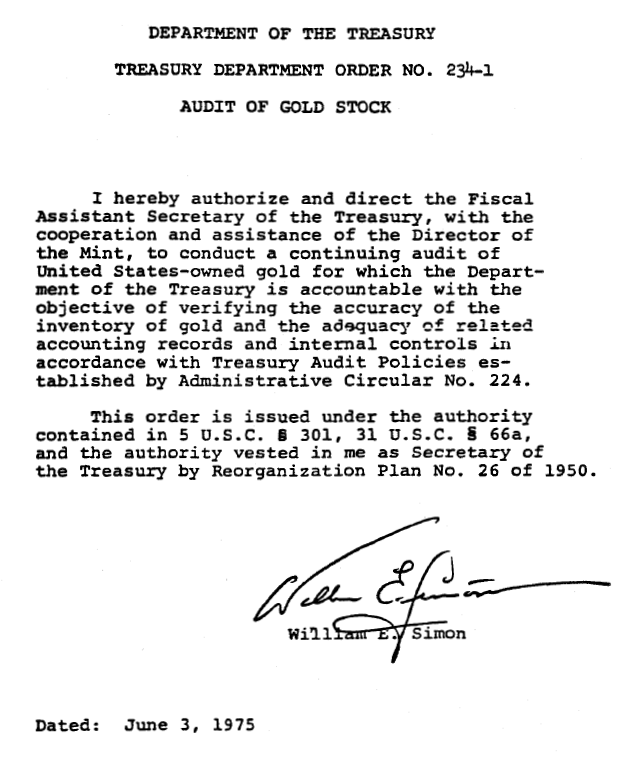 The Committee for Continuing Audits (The Committee hereafter) decided to include in their program the audit performed by the GAO in 1974, and thus officially the Continuing Audits of United States Government-Owned Gold (The Continuing Audits hereafter) were launched in 1975, but effectively the program ran from 1974. The explanation provided by Inspector General Thorson in his June 23, 2011 Statement to the House Financial Services Committee, at pages 3 and 4, sets out our responsibilities for Mint and Treasury financial statement audits under the Government Management Reform Act …. … 100 percent of the U.S. Government’s gold reserves in the custody of the Mint has been inventoried and audited. … I can say that without any hesitation, because I have observed the gold and the security of the gold reserves myself. Since 1993, when we [OIG] assumed responsibility for the audit, my office has continued to directly observe the inventory and test the gold. In fact, my auditors signed the official joint seals … placed on those compartments, inventoried and tested in their presence. At the end of Fiscal Year of 2008, all 42 compartments had been audited by either the GAO, the Committee for Continuing Audit of the U.S. Government-owned Gold, or my office, and placed under official joint seals. The financial statement audit is performed by KPMG under contract with my office. Exhibit 10. (1) The role of KPMG in the audits will be discussed later on in this post. From 1993 until 2008 the audits of the Mint held gold were completed by the OIG – although Thorson doesn’t mention exactly how much gold his team verified over this time horizon. Compartments audited at Mint institutions and depositories are kept under official joint seal by representatives of the audit committee. Any subsequent movement of gold in or out of audited compartments must be verified jointly, after which the compartment is resealed. These procedures are designed to keep the audited gold under control of the audit committee. Exhibit 11. (1) One melt averages about twenty bars cast from one crucible of molten gold. the fineness stamped on each gold bar in the melt. …. These officials [OIG] also told us that once the inventory of a selected compartment being audited was completed, the compartment was sealed with an official joint seal to control the gold reserves contained in the compartment. Attentive readers may have spotted a contradiction at this point. Thorson stated in 2011, ‘by 1986, 97 percent of the Government-owned gold held by the Mint had been audited and placed under joint seal. So once you have done that, and that seal remains unbroken, then I am not sure what other benefit there would be to going back into it at that point’. The GAO wrote in 2011, ‘for fiscal years 1993 through 2008, the compartments containing the deep storage gold reserves not audited by either GAO or The Committee, along with any previously sealed compartments that were opened, were selected and audited’. Whilst Thorson stated it was unnecessary for the OIG to re-audit compartments that had been audited prior to 1986, the GAO subtly mentions that some compartments physically verified in between 1974 and 1986 have at some point been re-opened. Why have compartments been re-opened when the audit protocol was designed to ‘avoid the necessity of verifying all assets in each audit’ so ‘having once been performed … will not have to be repeated as long as the assets verified remain under an unimpaired joint seal’? Why didn’t Thorson specify the subject of re-opening vault compartments in the congressional hearing? This re-opening of compartments is the core of my research, while everything in orbit of the nucleus – cementing its position – will be addressed as well. What we’ll find is that nearly all compartments have been re-opened and/or re-sealed many times for dubious reasons. Make no mistake, the narrative constructed by the US government with respect to the audits is neatly dressed up appearing to be trustworthy. Of course, the Treasury wouldn’t present anything that is feeble at first sight. The problems, however, emerge when we seek below the surface, to find misconduct, deceit, inconsistencies and loose ends. A few paragraphs down this analysis will require intense puzzling: accounting protocols, the web of all entities involved and an abundance of data make it a convoluted subject to decipher. In my opinion the audits could have been executed simpler, but it seems the US government created as many layers of rubbish to bury the facts as deep as possible. At the same time, I deem it necessary to expose the cracks at the seam in great detail. 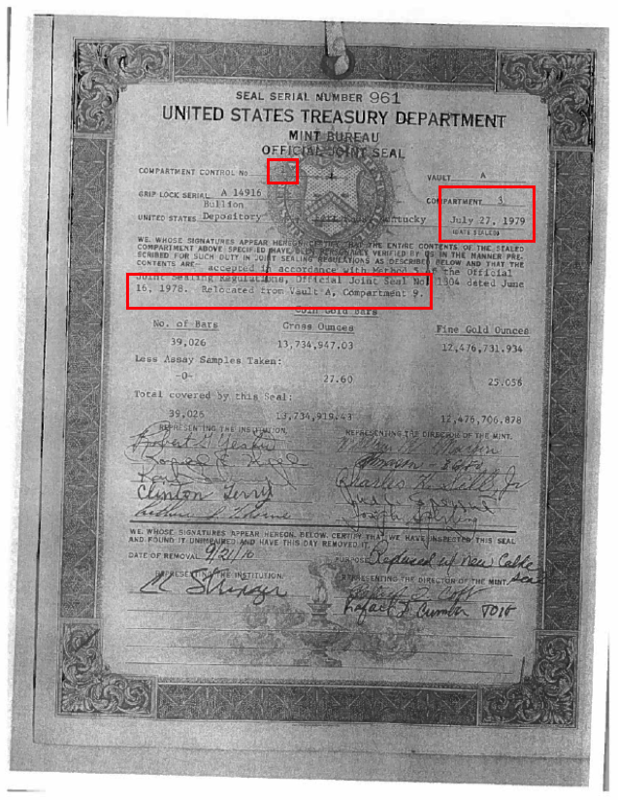 Problem 1) An audit of the Treasury’s gold in the 1950s was not completed. Immediately after the Eisenhower administration assumed office in 1953 an audit of the gold bullion of the Treasury department was initiated. Though audit and assay reports are missing, all we have are a few pages in the 1953 Annual Report of the Secretary of the Treasury, clearly the audit was never completed. The Annual Report mentions a club of advisors verified three compartments at Fort Knox holding 34,399,630 fine troy ounces (1,070 tonnes). 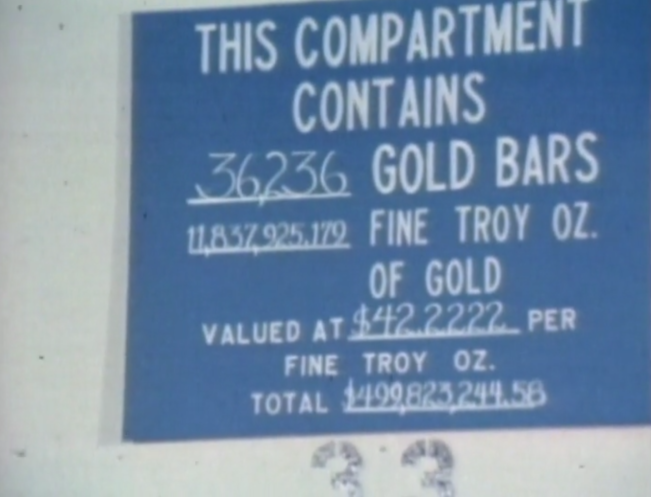 The remaining 322,269,381 troy ounces (10,024 tonnes) at Fort Knox weren’t audited as, ‘it is the opinion of this committee that the same agreement would be found should all of the compartments be verified’. In 1954 zero gold was physically verified, only the seals on the compartments were inspected. All in all, this was everything but a full audit of the US monetary gold. Less than 6 percent was physically audited, or 34,399,630 ounces (1,070 tonnes) of in total 596,756,651 ounces (19,631 tonnes). An important question to be imposed is why the US government stopped auditing after just three compartments at Fort Knox? This defeats the whole purpose of an audit. Problem 2) The OIG lost 10 audit reports from 1974 through 1986.
as well as GAO’s 1974/1975 and 1978 reports. That’s everything we have, or are aware of. Several FOIAs aimed at obtaining reports drafted by The Committee, inter alia directed at the National Archives and Treasury department, didn’t yield anything in addition to what Delmar had sent. At the bottom line, instead of the thirteen reports (1974 – 1986) the OIG should have in its possession to be able to substantiate The Continuing Audits, it has but five (1974, 1975, 1977, 1985, 1986). So how can Thorson be positive ‘100 percent of the U.S. Government’s gold reserves in the custody of the Mint has been inventoried and audited’, if his department possesses just a fraction of the audit reports from 1974 until 1986? Could you provide a report, or an otherwise comprehensive document on the following items related to U.S. gold holdings?… A complete history of the audits, assays, and inventories, at least as far back as 1975 if not earlier. …It should be noted that most workpapers associated with our reports issued prior to 2004 have been destroyed in accordance with our records retention policy. 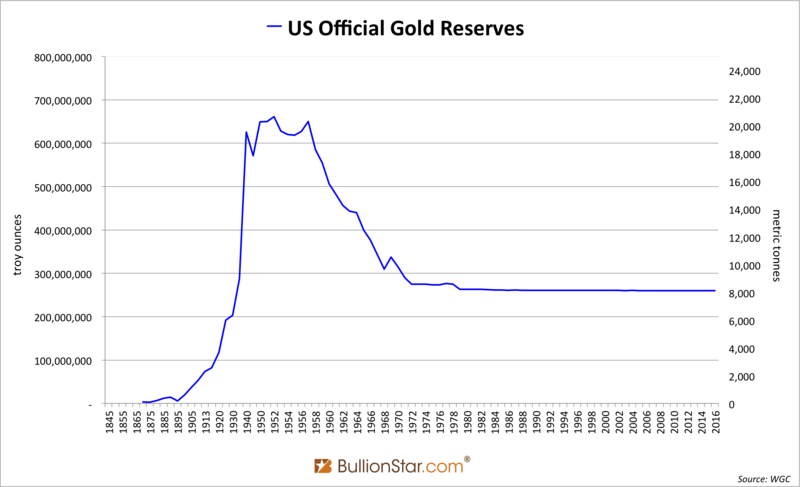 Stunningly, the US government has destroyed most documents drafted from 1974 until 2004 associated to the audits of its 261,498,926 ounces (8,134 tonnes) of gold that serve to underpin the world reserve currency. 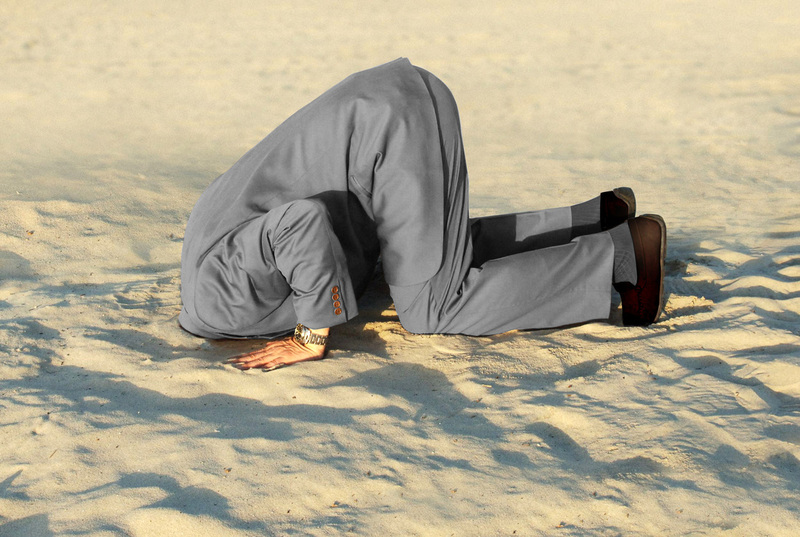 Thorson is hiding behind the fact that the OIG is not obliged to preserve reports indefinitely. But then why did his department save the four documents sent to me by Delmar? Why has the US government been selective in saving reports? And aside from any ‘records retention policy’, would it be rational to destroy the most important pieces of evidence – meant to proof the existence of the largest official gold hoard globally – promptly after assembled? The essence of auditing the US’ monetary gold stock was to reassure global commerce that in any extreme scenario all dollars in circulation are supported by gold, providing essential confidence and credibility. Once you’ve proven the gold is there, why throw away the evidence? When I did some more research I found another audit report from 1974 on the GAO website, and the summary of the 1980 audit and the full report of 1981 on the website of colleague gold researcher Reg Howe. Six audit reports (1976, 1978, 1979, 1982, 1983 and 1984) are missing. Problem 3) The FRBNY gold was supposed to be audited under The Continuing Audits program but was considered ‘unaudited’ in 1986. Gold at the Federal Reserve Bank of New York is audited periodically by examiners of the Board of Governors of the Federal Reserve System. … The audit procedures followed were essentially the same as those followed at Mint institutions except that assay samples were not taken to verify the purity of the gold and the audited gold was not under Committee control after the audit. As a result, the gold at the Bank is considered unaudited. The gold at the FRBNY was considered unaudited by 1986 because no assay samples could be taken and the metal never came under control of The Committee. By bypassing The Continuing Audits the FRBNY compartments did not come under joint seal, implying this gold could be conveniently transported in and out of the vaults, possibly through an underground corridor to the adjacent private vault at 1 Chase Manhattan Plaza. Please read this blog post by BullionStar gold researcher Ronan Manly for more information on the construction of the FRBNY vault and the underground connection to the private gold vault across the street. Also, since 1974 the volume of the Treasury’s gold at the FRBNY has increased, which elevated the amount of gold that didn’t come under control of The Committee. Before 1974 the FRBNY stored 4.2 million ounces (131 tonnes) of yellow metal for the Treasury (exhibit 4), by 1986 this volume had mushroomed to 13.5 million ounces (418 tonnes). In other words, an increment of 9.3 million ounces (288 tonnes) escaped The Continuing Audits. Problem 4) While not completed The Continuing Audits were discontinued in 1986. In a September 19, 1986, memorandum The Committee concluded to cease Treasury Order No. 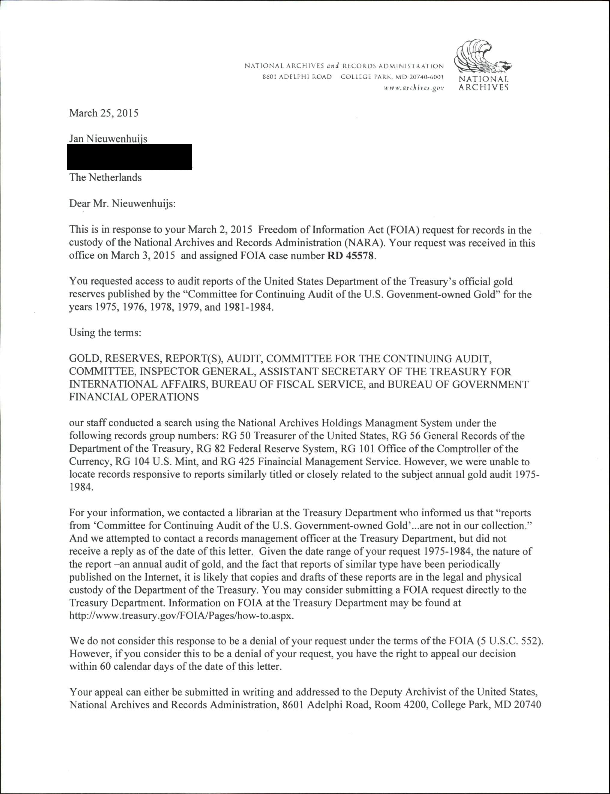 234-1 (The Continuing Audits) while it had reviewed 91.9 % of the US’ monetary gold. Annual audits of the gold were advised not to be executed any longer. Why were The Continuing Audits not completed? According to The Committee in 1986, ‘virtually all of the gold in custody of the Mint had been audited and essentially no discrepancies were found’. This is a weak excuse. If this excuse was valid why would any audit ever be completed? Remember, in 1953 the audit wasn’t completed either. Thereby, the fact that new audits were initiated in 1974 confirms the audit of 1953 was invalid, or the process didn’t need to be repeated. Although The Continuing Audits were meant to verify ‘all the gold for which the US government is accountable’, The Committee gave up in 1986 before the job was finished. Problem 5) Numerous compartments have been re-audited from 1983 until 1986 for dubious reasons. Effective October 1, 1982, the Internal Audit Staffs of BGFO and the United States Mint [parts of The Committee] were reorganized under the Department of the Treasury, Office of the Inspector General [OIG]. Before 1993, we weren’t leading the audits but were part of the committee on continuing audits that put the gold under seal. We assumed responsibility for … audits in 1993. Although Delmar writes the OIG didn’t lead the audits in 1983, I dare to say the evidence is against him. In a moment we’ll see that since 1983 the OIG was not only leading the audits, it also started re-opening previously verified compartments. By September 1982 one hundred percent of the gold at Fort Knox had been verified, though not all metal at West Point and zero at the FRBNY. The next year, strangely, the OIG started re-audits at Fort Knox (re-opening compartments) ‘in accordance with the plan approved by the Treasurer’. At Fort Knox 54,455,432 ounces were re-audited from 1983 through 1986. With respect to the Denver depository, from 1984 to1985 the amount of gold re-audited accounted for 7,575,976 ounces (236 tonnes). 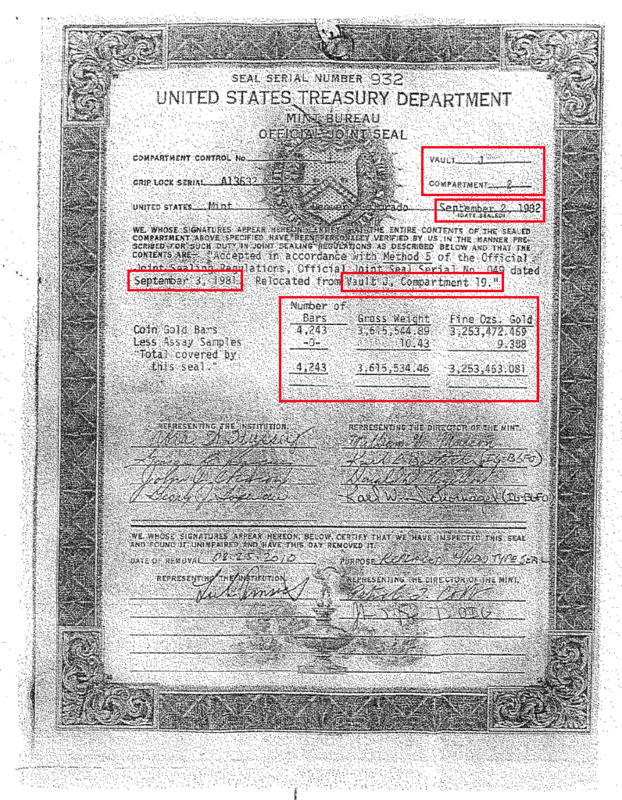 On March 4, 1983, the Inspector General of the Department of the Treasury recommended to the Treasurer of the United States that, upon completion of the continuing audit authorized by Treasury Order No. 234-1 [The Continuing Audits], a statistical sample of gold melts within randomly selected compartments at each Mint depository be inventoried and assays tested on an annual basis. …In fiscal year 1986 audits of Government-owned gold were also conducted at the United States Mint in Denver and the United States Bullion Depository in Fort Knox, Kentucky. The total gold holdings at both facilities were previously audited under the June 3, 1975, continuing audit program. The … [re-]audits were conducted at Denver and Fort Knox in accordance with the revised audit guidelines that require a statistical sample of gold melts within randomly selected compartments at the facilities. Notable is that re-audits from 1983 through 1986 at Fort Knox and Denver were conducted under the ‘revised audit guidelines’ though at West Point The Continuing Audits rules still applied. In 1986 not only The Continuing Audits were aborted prematurely, any re-audits by the OIG according to the revised guidelines were discontinued as well. Why didn’t the OIG finish to audit West-point with either set of rules? And, why didn’t the OIG continue (re-)audits at any depository after 1986? I find it strange revised guidelines were implemented for only a short period. What unfolded opens the possibility the revised guidelines were an excuse to re-open compartments, which would explain why the OIG prefers to uphold a narrative it had nothing to do with the (re-)audits in the eighties. I am responding to your FOIA for all audit and assay reports of the US Official Deep Storage Gold drafted in between 1993 and 2008. Our review of our files indicates that the attached documents constitute all records we possess which are responsive to your request, and thus a full response to your request. Zip file with the above noted audit reports. A separate report was not issued for 1993; however, the 1994 audit includes an opinion on 1993. Gold Assay Report for 2006 and 2005 (performed by White Sands Test Center), 2004 (performed by Ledoux & Company, Teaneck NJ). Exhibit 24. All attachments Delmar transferred to me (the word file, zip file, and the gold assay reports) can be downloaded by clicking here. See the official audit reports Delmar sent me below. All PDFs listed with official document names and dates are clickable for easy access. 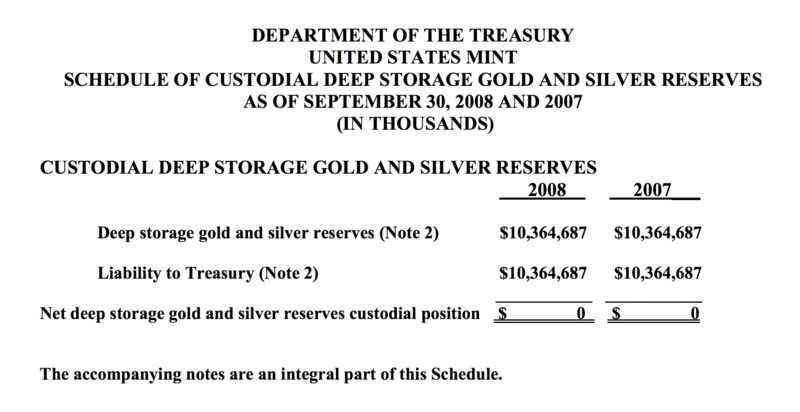 In our opinion, the accompanying Custodial Schedule presents fairly, in all material respects, the balance of the United States’ Deep Storage Gold and Silver Reserves in the custody of the Mint as of September 30, 2008 and 2007, in conformity with U.S. generally accepted accounting principles. Exhibit 26. The Custodial Schedule US Mint 2008 is a total of gold stored for the Treasury. The gold is valued at $42.2222 per fine troy ounce. Accordingly, every ‘Audit of the United States Mint’s Schedule of Custodial Deep Storage Gold and Silver Reserves’ document from 1993 through 2008 is written in SALY format (Same As Last Year) and thus refrains from disclosing how much gold was physically verified (counted, weighed and assayed) in what year. The OIG can hide behind convoluted auditing structures that allow these reports to be as they are but I wasn’t satisfied. Exhibit 27. Official Joint Sealing (OJS) sheet by the OIG. For downloading the original sheet click here. 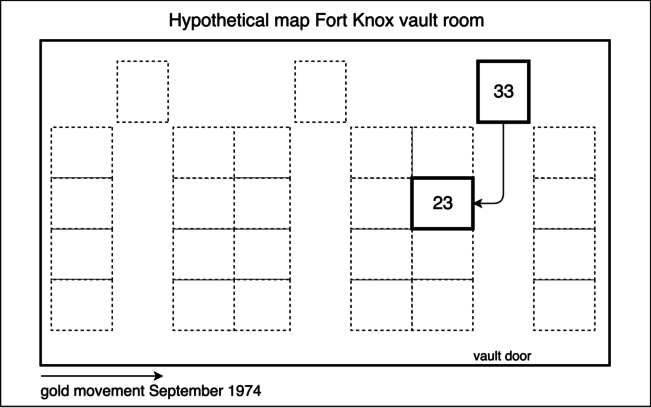 Problem 6) Fort Knox compartment 23 was audited in 1974 but sealed eight years later. 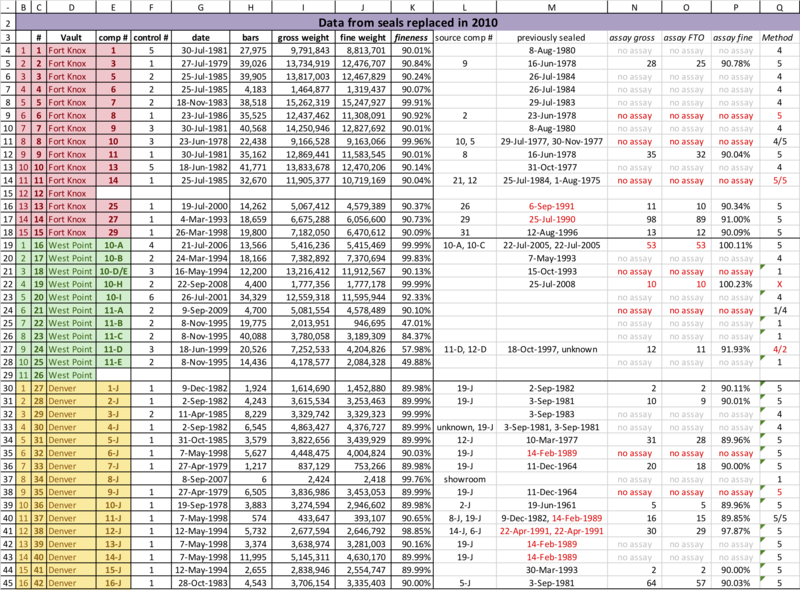 From the spreadsheet (The Sheet hereafter) more problems can be detected. This is where the real story starts. We can see in The Sheet there are currently 36,236 bars comprising 11,837,877 fine troy ounces stored in Fort Knox compartment 23. Film footage shot inside Fort Knox on September 23, 1974, shows that compartment 33 contained 36,236 bars comprising 11,837,925 fine troy ounces was opened that day. The number of bars in both compartments is exactly the same, the fine weight differs by 49 troy ounces. Exhibit 28. One frame from footage shot on September 23, 1974, of Fort Knox compartment 33. We previously learned that, ‘in performing the audit, the gold bars are physically moved from one vault compartment to another’. What happened is that on September 23, 1974, Fort Knox compartment 33 was opened, the 36,236 bars inside taken out to be inventoried, weighed and assayed, subsequently to be stacked in compartment 23 across the vault room. In The Sheet we find no other Fort Knox compartment that holds a number of bars equal to 36,236, or fine troy ounces close to 11,837,925, except for compartment 23. The gold in compartment 33 audited in 1974 must have been moved to compartment 23. The 49 fine troy ounces discrepancy between both compartments is due to assay tests performed (metal drilled from the bars for the laboratory). Exhibit 29. Illustration of gold movement from Fort Knox compartment 33 to 23 in September 1974. Asking Delmar numerous times over email why Fort Knox compartment 23 was sealed eight years after it was physically audited prodded no response. Problem 7) Official Joint Seal is missing. Exactly the one from Fort Knox compartment 23. In front of the subcommittee Thorson stated that all 42 Official Joint Seals (OJS) had been replaced (re-sealed) for newer seal types in 2010. The Deep Storage covers changed from ‘cloth tape with wax’ to ‘steel cables with locking seal’. As an example, Thorson showed the subcommittee the old seal that had come of compartment 2-J in 2010. Exhibit 30. OJS covering Denver compartment 2-J that was replaced in 2010. Date the compartment was sealed. Total gross and fine weight in the compartment. Gross and fine weight taken for assay samples when the compartment was physically verified. From which compartment the gold was sourced (in the case of 2-J the gold came from 19-J). Date the sourced gold was previously sealed (in the case of compartment 19-J it was September 3, 1981). Next, to follow up on my lead regarding compartment 23, I invited the OIG (through a FOIA) to send me digital copies of all the 42 seals that were replaced in 2010. If the OIG had saved one seal, the one Thorson showed for the subcommittee, they must have saved them all I reckoned. And so Delmar went to the scanner for us and made digital copies of all seals that were replaced in 2010. He missed but two. After the usual hindrance – Delmar sending some copies twice, excluding others, while I was submitting more and more FOIAs and waiting for months on the results – eventually I received 40 seal copies. The ones missing are West-Point compartment 11-UP and Fort Knox compartment 23. The latter, coincidentally, being the compartment seal I had confronted Delmar with because it was placed eight years after physical verification. When I telephoned Delmar to ask why he refused to send me the seal of Fort Knox compartment 23 he said, clearly angry and annoyed, ‘that’s all we have’, ‘sir, you’re becoming a real pest’, ‘I’m not in the position to answer any more questions’, and then he hung up while I was talking. I find it suspicious Delmar refused to send me the seal that was replaced in 2010, which was exactly the one he knew would show me an irregularity in the auditing procedure. The other seal he didn’t send me belongs to West-Point compartment 11-UP, which later on we’ll discover was not audited by 2008 (although Thorson has stated under oath 100 percent of the gold at the Mint was verified by then). What Delmar didn’t realize is that the 40 seal copies he did sent, show us many other irregularities in the auditing procedures. They will proof to be the Rosetta Stone of my investigation. Problem 8) The custodian performed audits from 1986 through 1992. In pursuit to propel my quest forward I conceived a new spreadsheet (New Sheet hereafter), joining the information from the 40 seal copies Delmar had sent. Exhibit 31. Download sheet here. On the rows of Fort Knox 25 and 27, and Denver 6-J, 11-J, 12-J, 13-J and 14-J we can see these chambers were sourced with gold previously sealed in between 1989 and 1991 (see red numbers in column M). This is a big problem and I will tell you why. When he spoke in front of the subcommittee in 2011 Thorson never mentioned anything about audits in between 1989 and 1991; he only mentioned the periods from 1974 until 1986 (The Committee) and 1993 through 2008 (OIG). What I discovered is that there are two statements by Thorson. From 1986 to 1992, the Mint continued to perform an annual inventory and verification of the gold reserves in accordance with its own policies over those compartments that had not been placed under Official Joint Seal by the Committee for Continuing Audit of the U.S. Government-owned Gold. According to Mint officials, this was done to comply with the 1975 GAO recommendation discussed earlier. Exhibit 32. Written statement OIG 2011 (page 45). 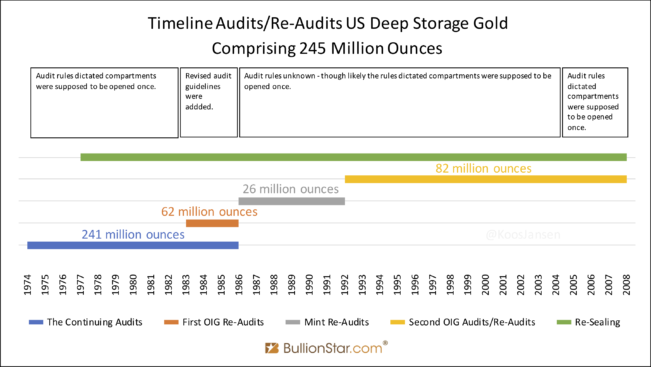 After The Continuing Audits from 1974 until 1986 and partly simultaneous re-audits according to revised guidelines from 1983 until 1986, the Mint, mind you the custodian of the Deep Storage gold, continued auditing metal ‘in accordance with its own policies’ from 1986 through 1992. As far as known these verifications of 25,591,885 ounces (796 tonnes) have not been monitored by any auditor, whether that be the OIG, GAO or an external contractor. This is similar to a bank opening up its customers’ safe deposit boxes. Thorson writes that in between 1986 and 1992 the Mint audited, ‘those compartments that had not been placed under Official Joint Seal by the Committee for Continuing Audit of the U.S. Government-owned Gold’. I believe this to be a falsehood. The seals show the Mint opened compartments at Fort Knox and Denver. However, in exhibit 20 it’s demonstrated Fort Knox and Denver were fully audited (and re-audited) by 1986 and thus under Official Joint Seal. And this exhibit comes directly from a document prepared by the OIG in 1986. Accidentally, the falsehood has covered up the re-opening of compartments. So far, we’ve learned that from 1983 until 1986 about 62,031,408 ounces (1,929 tonnes) were re-audited by the OIG and from 1986 until 1992 up to 25,591,885 ounces (796 tonnes) ounces were re-audited by the Mint without any supervision. Which begs the question, what happened from 1993 until 2008? From here it gets even wackier. Problem 9) There are reasons to doubt the overall credibility of the OIG. Concern can be raised about the general credibility of the OIG’s audits from 1993 until 2008. For example, the 1994 Deep Storage gold audit report was written by Inspector General Valarie Lau, who had to resign a few years later ‘after facing accusations that she had committed the kinds of transgressions her office was supposed to be rooting out’. The New York Times reported on January 17, 1998, this woman was found corrupt. Exhibit 33. Official audit report 1994. Exhibit 34. Official audit report 2008. 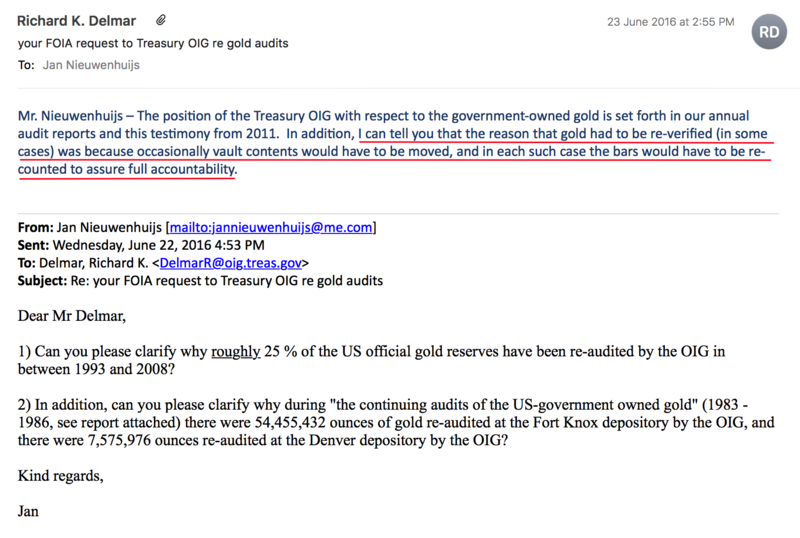 But Moy has been completely ignorant about the audit procedures at Fort Knox, Denver and West Point as demonstrated in my previous blog post Former US Mint Director Clueless On Gold In Fort Knox. No need to repeat the content here. Consider this: Moy has openly stated in 2015 on Twitter there should be a new ‘comprehensive audit authorized by Congress’. Seemingly, he didn’t have much faith in the audits performed by the OIG during his tenor. @NotoriousCLO @HereTizz @KoosJansen Not much but wouldn’t satisfy him. IMO there should be a comprehensive audit authorized by Congress. Exhibit 35. The Director of the Mint from 2006 until 2011 that was supposed to be aware of the audits factually knew nothing about the procedures and openly calls for a new comprehensive audit authorized by Congress. The majority of the bars are standard 400 ounce good delivery bars. That is what I was told by the Fort Knox protection staff. I would recommend a FOIA request to the OIG or the US Mint posing the question to get an official answer with appropriate documentation. That way you could be the first to break the news. Let this sink in. In addition to the fact Moy was ignorant about the audits and openly calls for a new comprehensive audit authorized by Congress, he advised me to submit a FOIA at the OIG and Mint to ‘break the news’ on the content of gold at Fort Knox. From his demeanor I sense Moy was discouraged by the ‘Fort Knox protection staff’ and OIG to interfere with the (audits of the) Mint’s custodial gold when he was in office. This while in hierarchy he was above the protection staff, not the other way around. 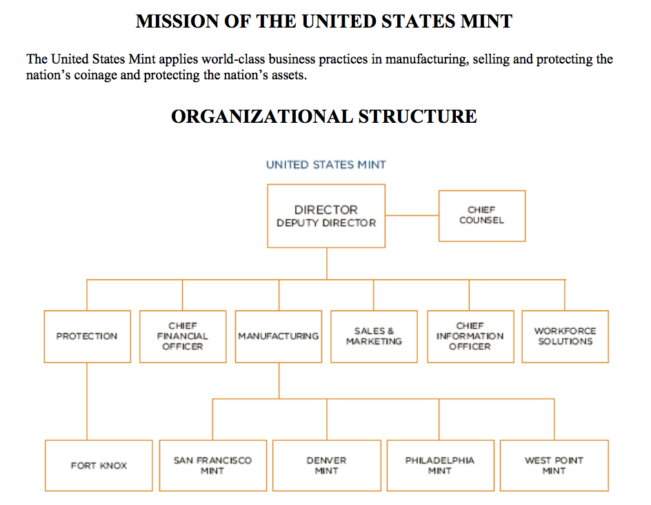 Or so it is shown in the Mint’s organizational structure. 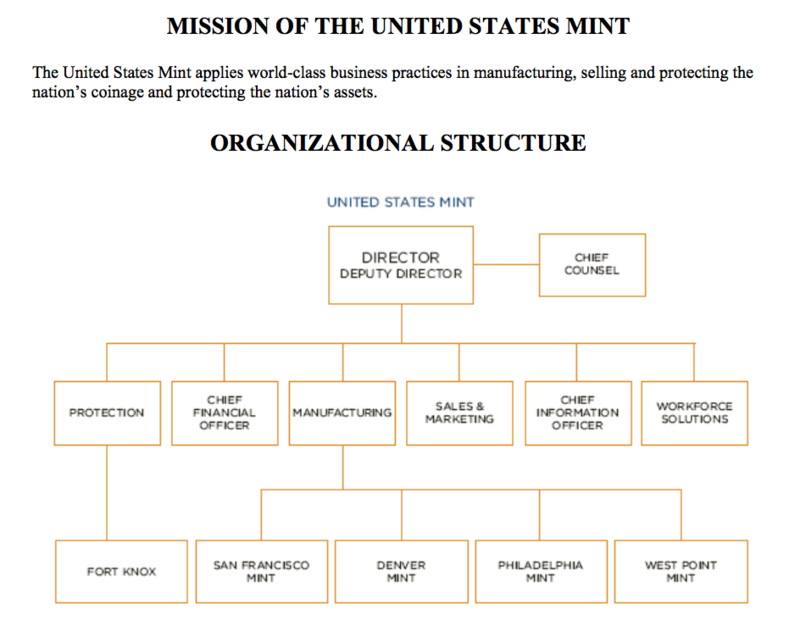 And from the Deep Storage auditing rulebook, we know the Director of the Mint is supposed to be involved in the process. Exhibit 38. Source (page 9). 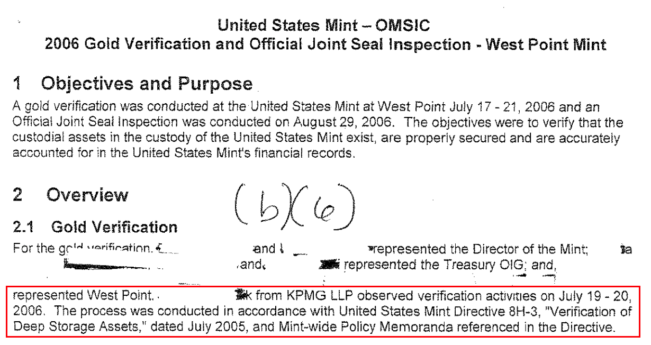 Did the Fort Knox protection staff and OIG somehow keep Moy in the dark about the (audits of the) Mint’s custodial gold? Problem 10) The external auditor (KPMG) relies on auditing work by the OIG, implying a limited role. Basically, audit standards allow, in appropriate circumstances, reliance on other audit work, and in the specific context of KPMG’s financial statement audit of the Mint, the agreement calls for their reliance on our gold reserves work, without specific reference to it. Hope this helps. KPMG relies upon our audit … and—therefore—KPMG doesn’t make reference to the audit that we performed (our report) in their audit report. See the attachments for the requirements that support the statement from IG Thorson. Exhibit 39. Download all attachments Delmar sent me here. As far as I know, starting from 1992 the United States Mint Reauthorization And Reform Act caused the Mint’s Custodial Schedule to enjoy scrutiny by an independent auditor. But what the Treasury did was cut a deal with an external party for it to rely on work done by the OIG for verifying the physical gold. The independent contractor never audited the gold purely by itself. Apparently, this is possible within auditing standards. Rather than hiring an independent auditor directly to audit its precious metal, the Treasury has conceived a structure whereby its resident auditor (OIG) forms the first layer to touch the gold, after which the independent auditor relies on work done by the OIG. Just as to create as much distance to the gold as possible. Not only are the OIG audits disputable, in turn, the audits by the external contractor fully rely on the OIG. … We [KPMG] did not audit the United States’ gold and silver reserves (Custodial Gold and Silver Reserves) for which this Mint serves as custodian. These reserves were audited by to United States Department of the Treasury, Office of Inspector General (OIG) whose report has been furnished to us, and our opinion, insofar as it relates to these reserves, is based solely on the report of the OIG. I copied the above quote [exhibit 40] directly from the original 2005 audit report as it appeared on the Mint’s website on January 13, 2007. Unfortunately the report has since been deleted and is nowhere to be found. Shortly we’ll study what KPMG did after 2005. Problem 11) The OIG continued with re-audits from 1993 until 2008 for dubious reasons. Since 1993, when we assumed responsibility for the audit, my office has continued to directly observe the inventory and test the gold. … At the end of Fiscal Year of 2008, all 42 compartments had been audited by either the GAO , the Committee for Continuing Audit of the U.S. Government-owned Gold [1975 – 1986], or my office [1993 – 2008], and placed under official joint seals. …We observed the counting of 246,203 bars, which equates to 81,638,569 FTOs (or 2,539 Tonnes). Exhibit 43. The compartments audited by the OIG are listed in The Sheet. More re-audits! What can possibly be the explanation for these re-audits? Exhibit 45. My real name is Jan Nieuwenhuijs. 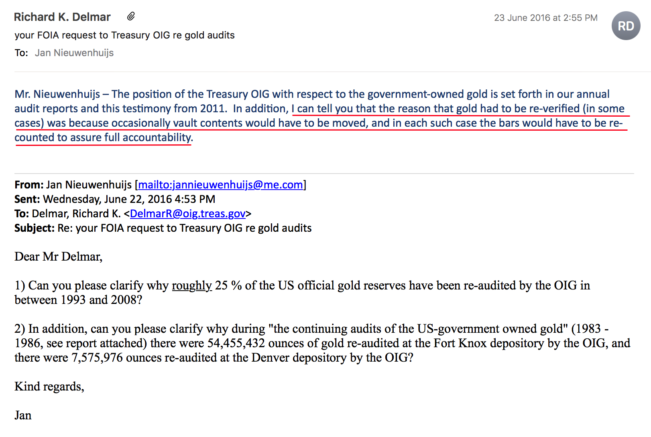 In a receptive attempt to understand why US Mint vault compartments have been re-opened and/or re-sealed as often as they have been, I invited the auditor responsible in clear language to introduce us a reasoning. Alas the offer was not redeemed, leaving the credibility of the OIG in a qualm. With respect to the re-audits from 1983 until 1986 and from 1993 through 2008 his response is all but satisfying. Again he mentions the ‘testimony from 2011’, which doesn’t describe any re-audits, and the annual audit reports from 1993 until 2008, which discuss no physical verifications whatsoever. Most important, he refrains from mentioning revised audit guidelines, so I fancy that argument can be officially negated. Furthermore, Delmar writes that in ‘some cases’ vault contents were moved and needed to be re-verified. Luckily for us the disposition of the gold can be traced through most of history. The next table shows to what extent the US’ monetary gold has moved between depositories since 1974. Exhibit 46. Since 1974 custodial gold at the Mint has slightly declined, and in 1981/1982 roughly 60 million ounces were moved from the New York Assay Office to West-Point (yellow). This amount had declined to 58 million ounces by 1986, likely after which 2.8 million ounces were relabelled as Working Stock (yellow). ‘Others’ include Philadelphia and San Francisco; likely these 3 million ounces have been transferred to Denver somewhere in between 1980 and 1986. There has been but one significant movement of roughly 60 million ounces from the New York Assay Office to West Point in 1981/1982 (see the yellow cells above). But this is not a solution to the problem. From the documentation we know that by 1986 a little over 86 percent of the gold at West Point (50,041,314 out of 57,854,461 ounces) had been audited. ‘So once you have done that, … then I am not sure what other benefit there would be to going back into it at that point’ (phrase borrowed from Thorson, 2011). 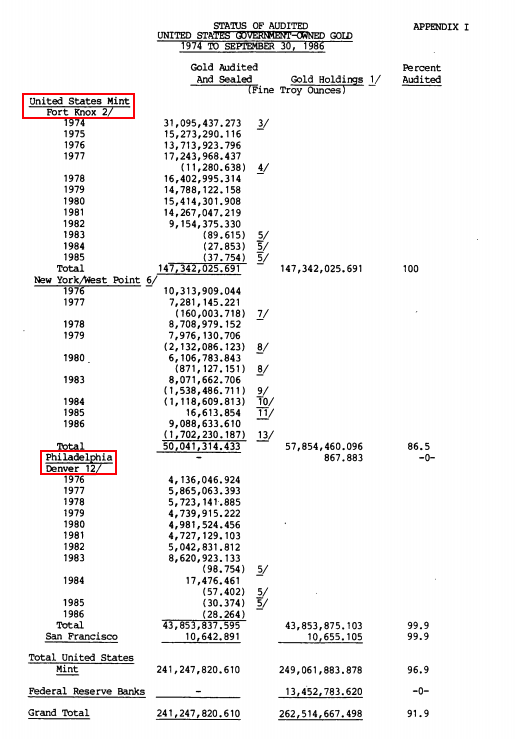 Only 7 million ounces were not audited at West-Point by 1986, yet the OIG audited over 80 million ounces after 1993. Delmar’s argument regarding gold movement doesn’t fit. I’ll share a bit more about my research journey. The email Delmar sent me, the one that contained the audit reports from 1993 until 2008, included a key document titled the Management Letter for the Fiscal Year 2004 Audit of the United States Mint’s Schedule of Custodial Gold and Silver Reserves. This note in itself is very valuable, but additionally, there’s a reference made in the letter to ‘the requirement that the Director’s Representative submit a written report to the Chief Financial Officer (CFO) notifying the CFO of the completion of the verification’. I suspected these reports are working papers of the verifications, and I was right. 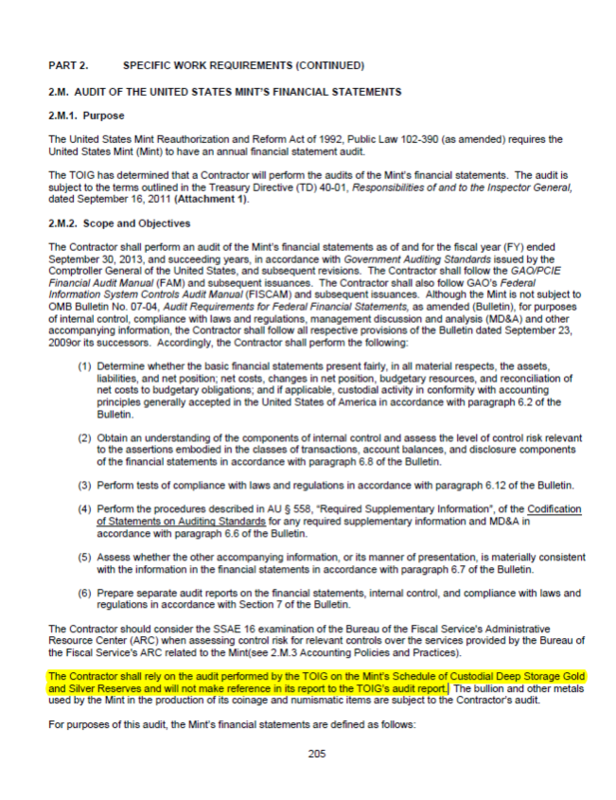 After a long and lingering FOIA procedure, I obtained several ‘memoranda submitted by the US Mint Director’s representative regarding audits of the Mint Schedule of Custodial Gold and Silver Reserves to the Chief Financial Officer drafted from 1993 through 2008’ (Memos hereafter, download here and here) from the Mint. 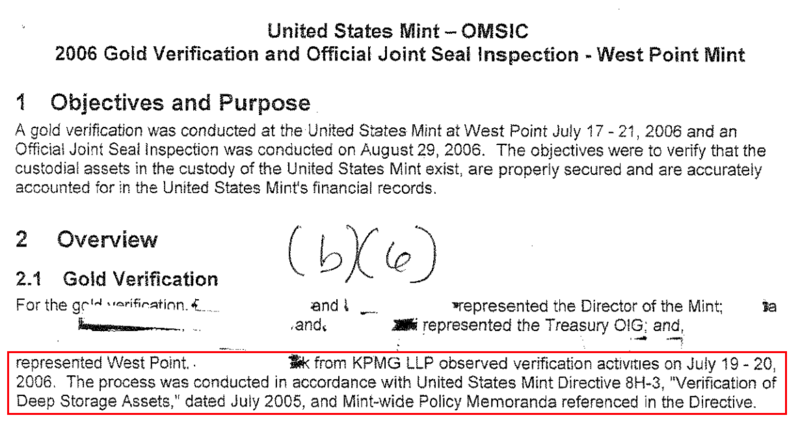 Stumbling forth on my path, another FOIA provided me with the Mint’s 2005 audit directive. The directive shows us, just like in 1975, that whenever a compartment has been ‘verified … the annual [audit] will be limited to inspection of the Seals’. Put differently: once verified the door remains closed. No re-audits. Exhibit 47. Mint’s directive 2005 (page 11). 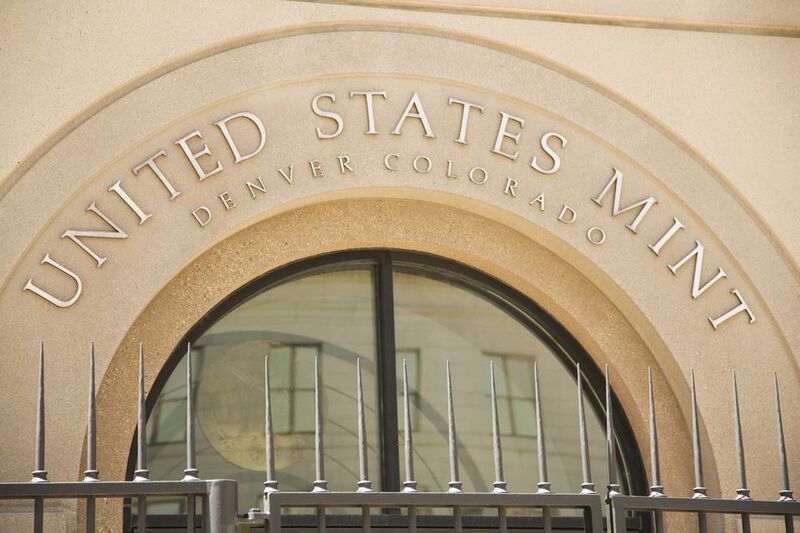 Problem 12) The US Mint has obstructed a FOIA request. In my experience the US Treasury, Mint and OIG will do anything within their power not to comply to a FOIA request. The National Archives (NARA), in contrast, have a much more cooperative character. I won’t bother you with the full story about my FOIA procedures that took me many years (although you can read the chapter ‘US Government Tight-Lipped About Fort Knox Audits’ in this post if you’re interested), but the gist of one request needs to be told here. 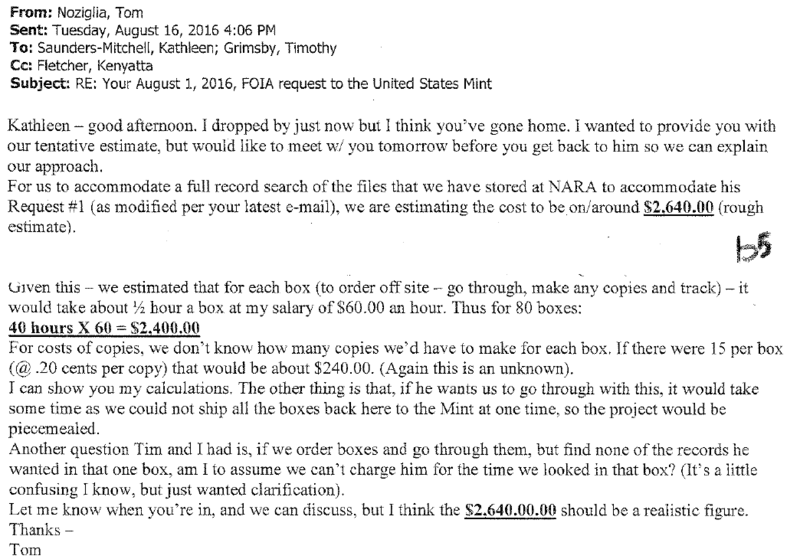 When I submitted a FOIA at the Mint in the spring of 2016 in order to obtain the Memos, they replied this request would set me back a whopping $3,145 dollars because it would take forty hours ‘for a full record search at the National Archives’, eight hours for review, and additional costs would be incurred to duplicate 1,200 pages. I thought this was nonsense: 1,200 pages seemed out of proportion and how did they know it were going to be this many pages if they had to search forty hours for it? To proceed, the only option left was to raise money through a crowdfunding campaign. Within 24 hours the campaign was completed and in August 2016 I sent the Mint the funds. Finally, late December of the same year the Mint delivered in total 223 redacted pages, which contained 68 pages of totally unrelated reports and 21 pages that were copied twice. Effectively, I got 134 pages that, above all, are incomplete. The table below shows what’s missing: about half of the OJS inspection reports and a few physical verification reports. Exhibit 48. Overview Memos in OJS inspections and physical verifications. When I confronted the Mint that I paid $3,145 dollars for a paltry and incomplete 134 pages they had to admit the costs had been over-estimated. They fully refunded me (and in turn I refunded the donors to my crowdfunding campaign) but the missing pages have never been found. Clearly the estimated costs had been meant to scare me off, which didn’t particularly work out. The Mint was caught red handed in their obstruction antics. Up till here was what I posted in my previous rant. Not long after I published it I contacted the National Archives (NARA) directly to ask if they had any more of the Memos I was looking for. If the Mint needed to reach out to NARA, why not ask NARA directly? Guess what, NARA replied they never had such memoranda in their archives. All the Memos the Mint sent me, the 134 pages, came straight from their headquarters. This makes the estimated $3,145 dollars even more laughable. It was all a pack of lies. Problem 13) Approximately one million ounces (30 tonnes) in gold coins have never been audited. Now I’ve told you about the existence of the Memos we can examine what’s in them. A few sub-chapters back you read Delmar refused to send me the seals of West-Point compartment 11-UP and Fort Knox compartment 23. The latter compartment has been discussed, which leaves 11-UP to be rebutted. The reason Delmar didn’t send me the 11-UP seal was because it doesn’t exist. One million fine troy ounces in foreign gold coins inside 11-UP have never been audited. Exhibit 49. The Continuing Audits report 1986. At the end of the audits in 1986 by The Committee 991,834 ounces (31 tonnes) in foreign gold coins at West-Point still needed to be verified by an expert to confirm the fine content. By then only the quantity of coins was established. Exhibit 50. Memo 2006 (page 84 and 85). Exhibit 51. Memo 2008 (page 102, 109). In conclusion, after more than three decades, starting in 1974 and ending in 2008, the fine content of the gold coins was never confirmed. Thorson’s claim in 2011 that the US’ monetary gold safeguarded by the Mint was audited for 100 percent by 2008 was not true, as his own department had written ‘they would not be supportive of accepting an OJS with a “said to contain” qualification’ in the Memo. What kind of auditing operation could fail for more than three decades to assess the fine content of a few coins? Problem 14) Deep Storage auditors failed weighing assay samples in 2004. As far as I know the Management Letter for the Fiscal Year 2004 was conceived because around then the audits of the Mint’s custodial gold, ‘have supported the annual audits of the Treasury Department’s consolidated financial statements, which incorporate the balances of the gold reserves held by the Mint’ (Thorson, 2011). Online are the Mint’s annual reports that show the custodial gold was not on the Mint’s balance sheet in 2004, but in 2005 it was. Changes in the Treasury’s overall accounting structure rippled through into the audit procedures at the Mint. Several adjustments followed: the external contractor Urbach, Kahn & Werlin LLP was replaced by KPMG LLP, for the first time in history the OIG was accompanied by an external contractor (KPMG) for physical verifications (at West-Point in July 2006, why KPMG did not attend in 2005 is unknown) and the external assayer Ledoux & Company was replaced by White Sands Missile Range, the latter being a division of the US Army. Exhibit 52. Memo 2006 (page 82). Exhibit 53. Memo 2005 (page 79). Of course the assayer should not have been contracted through an ‘inter-agency agreement’. Exhibit 54. Memo 2004 (page 44, 45). When all parties tried to reconcile the assay sample weights on July 22 and 23, 2004, they found out, ‘the scale [had been] reading at ounces rather than fine troy ounces’, because, ‘a setting on the scale had not been properly changed’. Allegedly this is what caused alternative readings in the books of the Director of the Mint’s Representative and the OIG’s Representative, and because nobody could figure out how to use the scale correctly they decided to postpone re-weighing until August 24, 2004. This failure of how to use a scale is a colossal blow to the credibility of the Deep Storage audits. For a number of reasons. The Memo reads, ‘the scale was reading at ounces rather than fine troy ounces’, but scales don’t read fine troy ounces. A scale reads troy ounces, and possibly avoirdupois ounces or grams, depending on the make, but it cannot distinguish the fineness of the metal. That’s what the assay test is for. This assertion is a hoax. 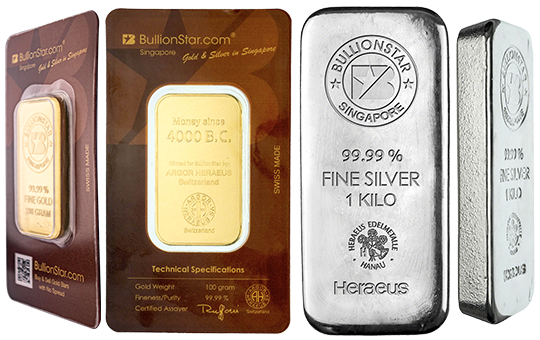 The Mint’s Bullion Ledger is denominated in troy ounces, so the scale should have read troy ounces up to four decimals all day long. Why change the settings? And how can it be that the scale read-out was recorded differently in the books of the Director of the Mint’s Representative and the OIG’s Representative respectively? 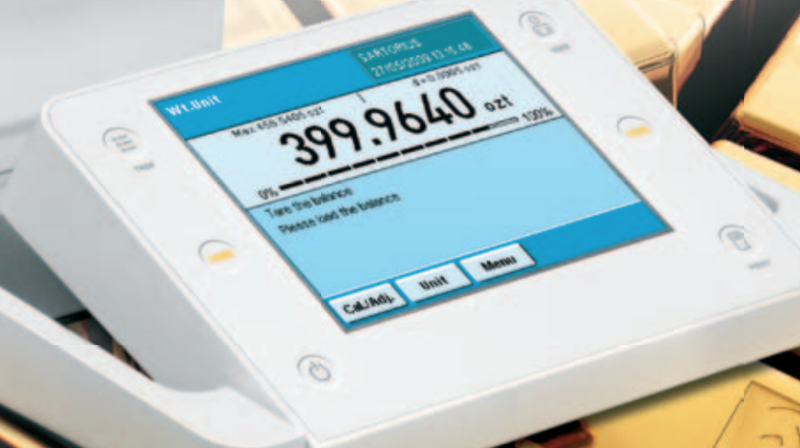 Any possible mistake in the settings of the scale, causing a false read-out, would be recorded evenly in both books. The excuses presented for the weighing blunder can’t possibly validate what happened and provoke a mixed reaction of distress, shame and laughter. Moreover, regarding the scale; the make, model and serial number of the apparatus should have been known, it should have been calibrated before and during utilization, and all this should have been meticulously documented as per gold industry standards. 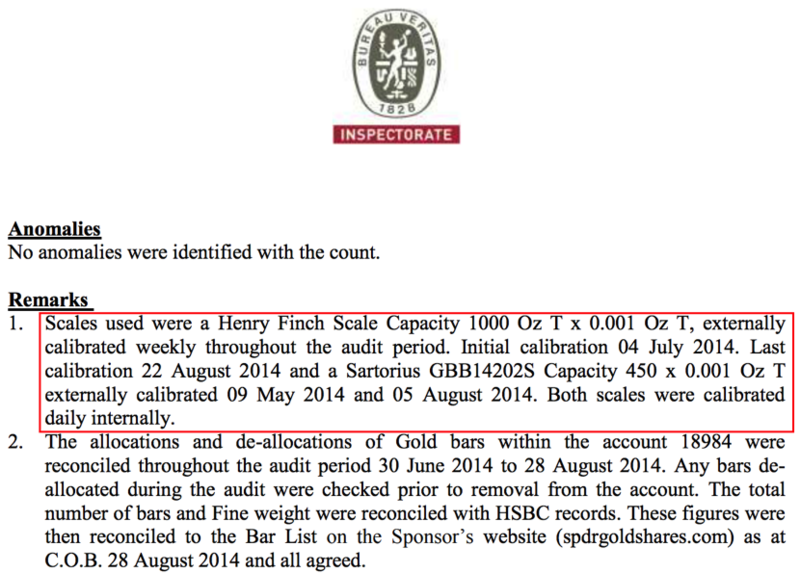 If we look at physical verifications of the largest gold ETF in the world by net assets, GLD, we find the aforementioned data clearly enclosed in the audit report. Exhibit 55. Example of scale make, model and serial number mentioned in audit report, next to proof of calibration of equipment. Source SPDR. For the audits of BullionStar clients assets, the scale name and serial number is recorded as well, and, of course, the equipment is calibrated. But in the Memos none of these essentials are disclosed. As a matter of course, if the scale used by the Mint had been calibrated before weighing, the disgrace that followed would have been averted. That year (2004) 71 bars were weighed and assayed, but it appeared that none of the auditors on the scene knew how to rightly use the scale. The Memo states the scale wasn’t properly functioning when weighing the assay samples, but what about the weighing of the actual bars prior to that? 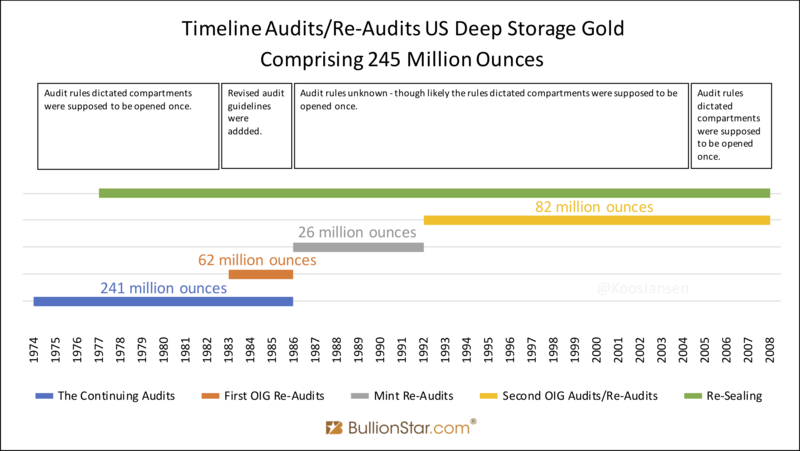 What about the weighing of all the Deep Storage gold bars under the supervision of the OIG since, say, 1993? 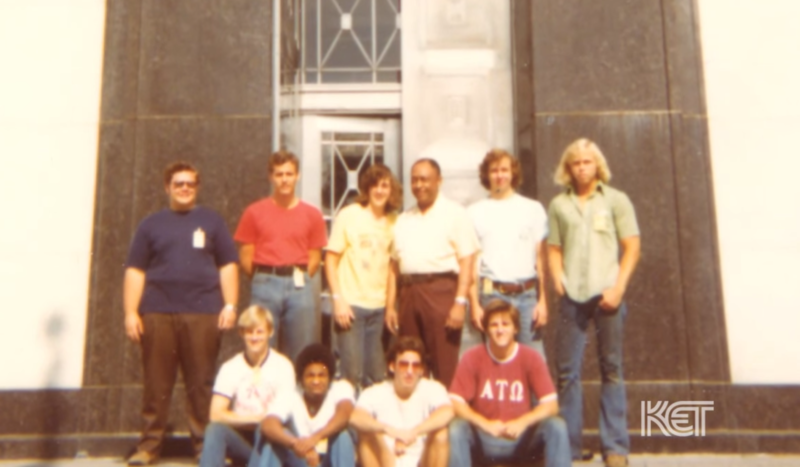 I was hired in 1975 as part of a group of young people that was chosen by the Treasury department to help them do audits at the vault. 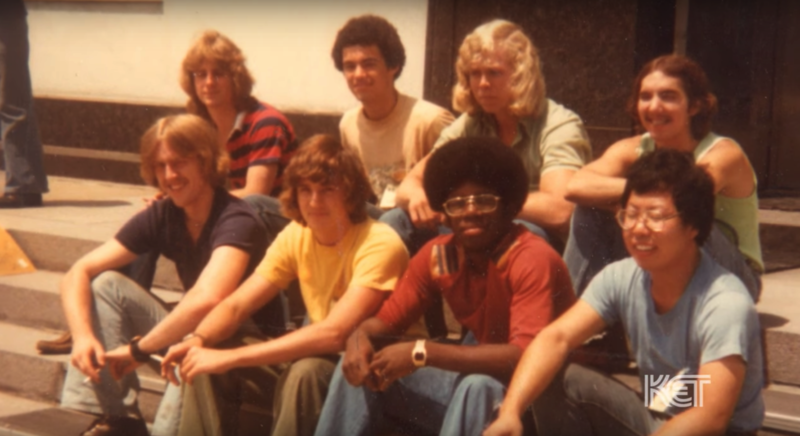 … I got a phone call in the summer 1975 from a man who was with the schoolboard and he asked me if I would like a job. And I said, yeah, I was coming out of high school and looking forward. And would spend the next eleven years doing various jobs for the United States Mint. Exhibit 59. Source. Picture from the auditors taken in front of Fort Knox. Simmons is the one wearing a yellow T-shirt. Instead of hiring professionals the Treasury telephoned a local school to recruit kids; the most ignorant and inexperienced labour. And why was the auditing crew altered in 1975 by hiring Simmons and his friends? Why didn’t The Committee continue its task with the bar handlers that worked at Fort Knox in 1974? Problem 15) Internal control was lacking at the Mint. In 2005 it surfaced that internal control was lacking at the US Mint. In my words, internal control systems have at their heart two elements: management supervision and segregation of duties. One of the purposes of an audit is to identify and assess the effectiveness of internal control processes and to observe and confirm whether internal control processes are being followed. 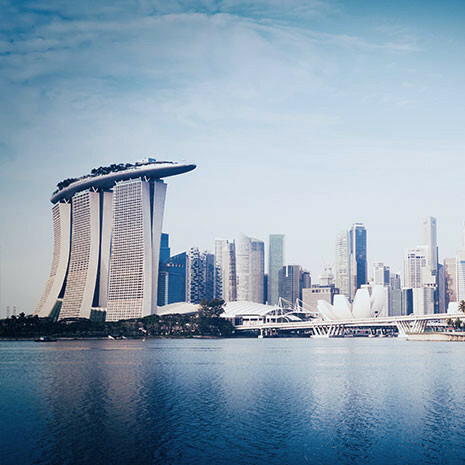 Internal control will also encompass elements such as physical security and IT security, but if management internal controls are not effective, then this will run the risk of compromise of even the most robustly secured gold depository. Verification of contents in a vault compartment is just a part of an audit. To give a flippant example, if a pallet of gold was stored in the middle of a field it’s not acceptable just to check that the contents every year (or in the case of the Mint check the seals of the compartments every year), as clearly the contents are at risk of theft. Likewise, the storage of bullion in a location where internal management controls are unsatisfactory is a similar risk. Verification of contents on an annual basis is not enough. Overall internal controls need to be assessed and verified. … during our audit, we noted a matter involving internal control over financial reporting, not required to be included in our audit report [hence not mentioned in the official audit report dated November 2004], that is presented below for your consideration. This comment and recommendation is intended to improve the quality and efficiency of internal control over financial reporting related to the Custodial Schedule. Improvements are Needed in the Custodial Gold and Silver Reserves Inventory Verification Policies and Procedures Established by the Mint’s Office of Management Services. Inconsistently followed and/or inadequate policies and procedures may cause errors in the gold and silver reserves inventory verification process and reporting of these balances in the Custodial Schedule. In addition, breakdowns in policies and procedures may have an adverse effect on the security of the custodial gold and silver reserves inventory. We recommend that the Mint establish and adhere to clear and complete policies and procedures that are consistent with approved Mint directives related to the verification and safeguarding of the custodial gold and silver reserves inventory. Mint management concurred with our finding and recommendation and is revising their policies and procedures to correct this weakness. Basically, they found the audits were anaemic and may have ‘cause[d] errors in the gold and silver reserves … balances in the Custodial Schedule’. And why hadn’t internal control audits looked at this before 2005? Why wasn’t this part of the scope of the annual audits from at least 1993 onwards? Activities affecting the receipt of the assay results were not effectively performed … [as mentioned]. Policy FIN-10, Official Joint Seals, paragraph 6, does not properly identify the responsibilities of the Plant Manager/OIC and Director’s Representative. Policy FIN-08, Assay Sampling of Deep Storage Assets, does not address the drilling of an umpire sample that remains with the U.S. Mint. Policy FIN-08, Assay Sampling of Deep Storage Assets, does not identify the party responsible for the samples after drilling. Policies are not consistent in identifying the party with overall responsibility for the gold verification. Policy FIN-10, Official Joint Seals, paragraph 7b, related to changing combinations of locks is not consistent with MD 8H-3, paragraph 8b. More colossal blows to the credibility of the audits. One wonders why these points were ‘not required to be included in [the] audit report’. As if the fact that it was unclear, ‘identifying the party with overall responsibility for the gold verification’, was irrelevant. I could write a book on what all went wrong, but let’s stay focused on the most important issues. Now we have established the audits prior to 2005 were poorly executed, what about the ensuing four years? A few more blunders need to be addressed. Problem 16) Inexperienced staff audited gold in 2006. Exhibit 62. Memo 2006 (page 83). Aside from the fact the Treasury continued to hire amateurs, in the Mint’s 2005 updated directive it’s described in high detail how to drill, weigh, and account for assay samples, and how to calculate fine troy ounces from gross weight. Even the most inexperienced – which sadly have been recruited for this hefty task – should have been able to actualize the steps. Problem 17) Deep Storage auditors failed weighing gold in 2008. Exhibit 63. Memo 2008 (page 55). Exhibit 64. Memo 2008 (page 56). Supposedly the auditors couldn’t clearly read the decimal point on the scale screen, which resulted in an error when weighing gold granules. After assay samples were drilled the auditors weighed the same amount in granules to replace the samples, in order for the total fine troy ounces ring-fenced in Deep Storage compartments to stay flat (this policy was adopted in 2000). But the assay laboratory found out from the paper work that the weight of the samples didn’t match the weight of the granules. Accordingly, West Point compartment 10-H had to be re-opened on September 22, 2008, to add an additional 9.3114 fine troy ounces in gold granules. 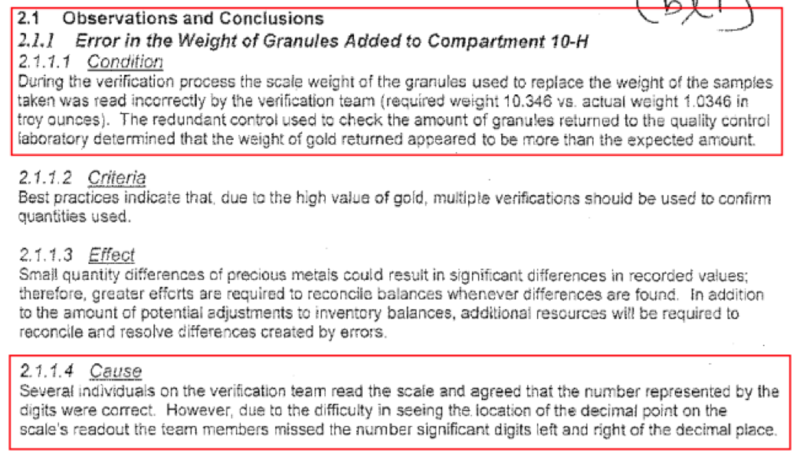 Be aware that before failing to accurately weigh the granules the auditors weighed 86 gold bars and the assay samples. My guess is that the scale, again, wasn’t calibrated and clearly the device wasn’t operated by qualified personnel. Anybody with the slightest knowledge of gold can even see the difference between 1 troy ounce and 10 troy ounces of gold. How do we know they properly weighed the 86 bars and assay samples? We don’t. Despite these clear guidelines Mint staff didn’t succeed in accurate weighing and neither did this tickle the attention of the OIG that was to supervise the measuring! Exhibit 66. Memo 2008 (page 54). This is worrisome all the more because in 2005 KPMG wasn’t present at any moment (exhibit 40), and in 2006 (page 82) and 2007 (page 91) KPMG missed the weighing and assaying just like in 2008. To my knowledge, KPMG never witnessed the weighing and assaying of gold bars at any Deep Storage depository. Problem 18) Assay tests were drilled near the corner of bar. What shocked me as well is that the Mint’s 2005 directive instructs the bar handlers to drill for assay samples ‘near a corner of the bar’. Why not through the middle of the bar a few inches deep to rule out there’s tungsten inside, one wonders. Exhibit 67. Mint’s directive (page 4). Only inexperienced bar handlers would obey to drill near a corner of the bar. Problem 19) Fort Knox compartment 31 was opened in 1996 for dubious reasons. To my knowledge – or more precise, according to the Memos in my possession – the GAO accompanied the OIG twice for Deep Storage audits since 1993, namely in 1996 and 1998. The first instance was at Fort Knox for OJS inspections. Although, for OJS inspections seals should only be examined for tampering, on August 12, 1996, two representatives from the GAO showed up in the vault room and decided to select ‘a single joint sealed compartment for opening and inspection’. Strangely, nowhere in Mint’s directive of 2005 I read the GAO has any involvement in Deep Storage audits (as opposed to the seventies when the GAO was ‘invited to participate in all audits’). Exhibit 68. Fort Knox OJS inspection report 1996. The report above doesn’t say what was stored in the compartment; how many bars and fine troy ounces it contained. Based purely on this document it would be impossible to decipher what exactly unfolded. However, by combining the info from the 1996 OJS inspection report with all seal copies, we can reverse engineer what happened. Below is the seal that was placed after a physical verification of Fort Knox compartment 29 in 1998. 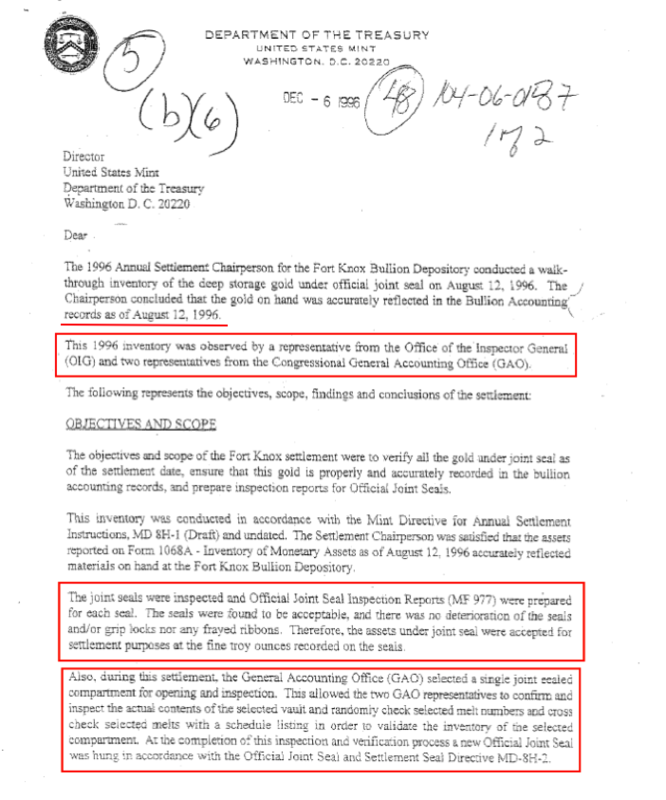 This document reveals the gold was sourced from compartment 31 previously sealed on August 12, 1996, exactly the day the GAO opened a compartment at Fort Knox. Exhibit 69. Fort Knox compartment 29 seal copy. With the two dates on the seal we know what happened. 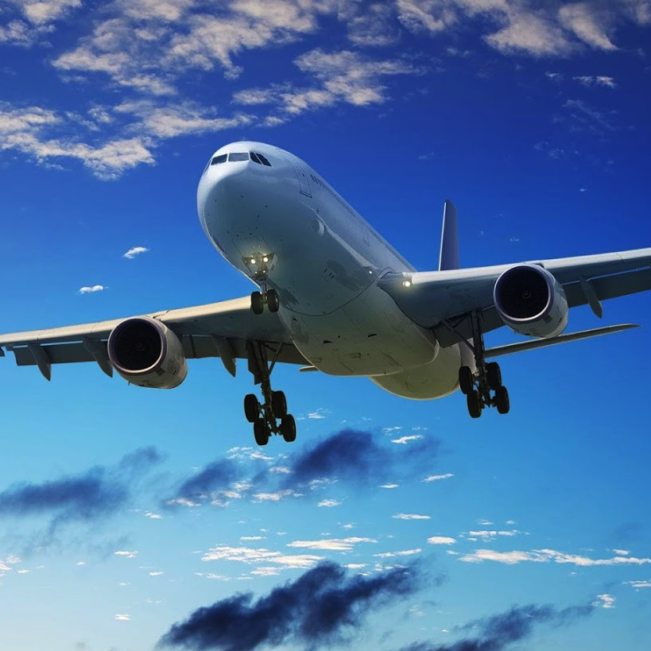 Without a doubt on August 12, 1996, the GAO opened compartment 31, holding 19,800 bars, to inspect the contents (count and weigh a few bars), after which this batch was fully verified in March 1998 by the OIG and GAO and moved to compartment 29. The verification report from 1998 (page 7) mentions the GAO observed ‘the opening of the outgoing compartment, the weighing and drilling process …, the sealing of the new storage compartment and the transfer of the samples to the driver of the armoured car carrier for subsequent delivery to an assay laboratory’. In the Mint’s 2005 directive the GAO is not mentioned once (I don’t have the previous directive). I doubt if the GAO had any authority to open compartments in the nineties. In 2011 Thorson stated, ‘since 1993, when we assumed responsibility for the audit, my office has continued to directly observe the inventory and test the gold’. If the OIG is responsible how come the GAO could break a seal in 1996? Exhibit 70. Mint’s directive 2005 (page 20). The GAO isn’t mentioned. Exhibit 71. Mint’s directive 2005 (page 12). How could the GAO – or the OIG for that matter – open a compartment during an OJS inspection? This is against the rules. OJS inspections and physical verifications are separate events (exhibit 47). 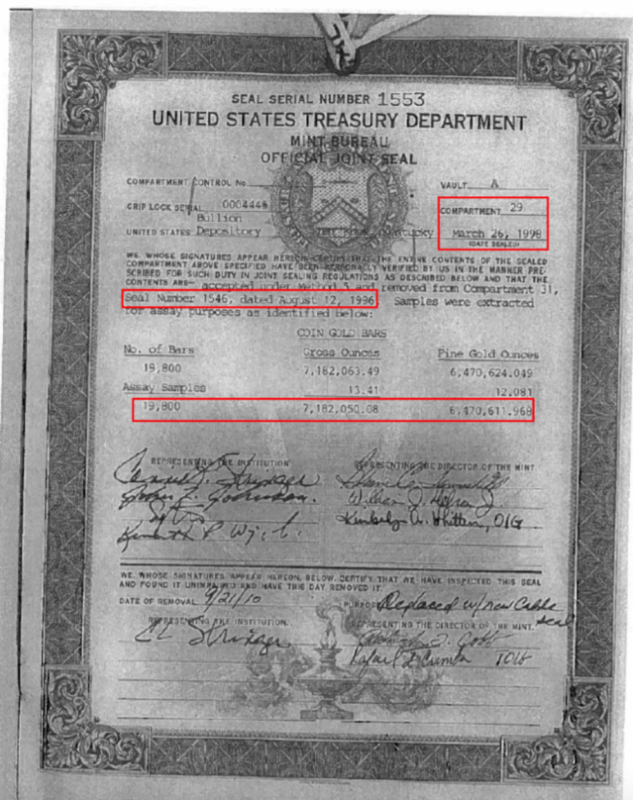 Why was any gold verified at Fort Knox when this depository was already fully audited (and re-audited) by 1986? How could the GAO verify a compartment by merely counting and weighing a few bars in 1996? The Mint’s 2005 directive is clear that all contents should be counted, weighed and assayed for verifying a compartment (exhibit 47). If compartment 31 was verified in 1996 by the OIG/GAO, why was it verified again in 1998 by the OIG/GAO? 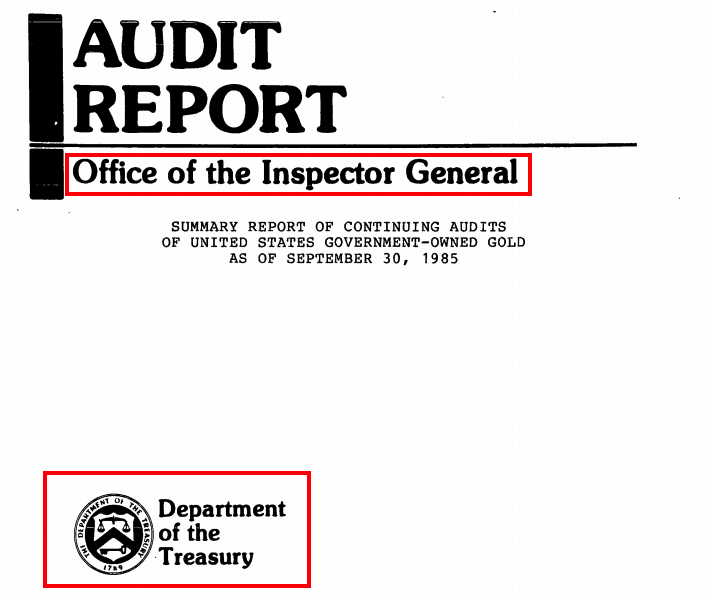 The fact these 19,800 gold bars were re-audited in 1998 confirms what the GAO did in 1996 was pointless from an auditing perspective and thus inappropriate. The Mint’s 2005 directive states the OIG will only verify compartments that have not been previously verified by the OIG. Exhibit 72. Mint’s directive 2005 (page 12). If I’m allowed to speculate I would say it’s possible the GAO put in a few bars in compartment 31 in 1996 so it could pass a full verification in 1998. Of course, the GAO had to be present on both occasions for proper guidance. Alas, the GAO is exempt from FOIAs. On their website we read, ‘the Government Accountability Office (GAO) is not subject to the Freedom of Information Act’. Keep in mind, the 19,800 bars in question had been touched twice in a very short time frame. In the next sub-chapter we’ll see that many more compartments have enjoyed this double treatment. Problem 20) Many compartments have been opened one year before or re-sealed one year after physical verification. 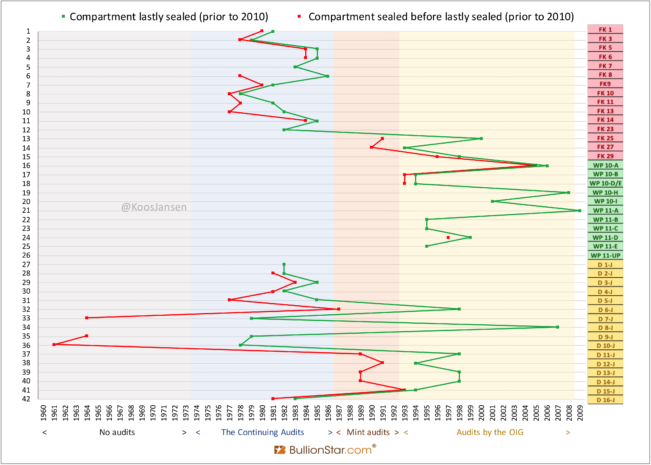 Many compartments at Mint depositories have been re-opened and/or re-sealed for unfitting reasons according to my analysis. Meaning seals were removed, exposing the chambers they covered inadvertently to external threats, after which new seals were installed. So far, we’ve exposed dubious re-audits by the OIG from 1982 until 1986, by the Mint from 1986 until 1992, and then again by the OIG from 1993 until 2008, while the OIG provides all sorts of false explanations. The total amount of gold related to these re-audits can be up to 140 million ounces, though impossible to compute precisely as we don’t know to what extent re-audits overlap each other. But more suspicious events have unfolded at Mint depositories. In the previous sub-chapter we saw examples of compartments that have been re-opened in a very short time frame. Believe it or not, but this has been the case for many more compartments, especially at Fort Knox. What I thought to be a helpful way to get our heads around this compartment puzzle was to make a chart (The Chart hereafter). Exhibit 73. On Y-axis are 42 compartments (on the left numbered 1 to 42, on the right the official numbers and depository). Basically, this chart shows 42 timelines. What strikes me, especially after connecting the dots, is that for many compartments the doors were opened and/or re-sealed roughly one year before the audit, or roughly one year after. Have a look at Fort Knox compartments 1, 3, 5 and 7 for example, which all had a seal life of one year. We can see this trend throughout The Chart, most of the time the green and red line are not very far from each other. This compartment was sealed in 1981 – before any re-audits occurred – but before that sealed in 1980. On the seal we read ‘this is a replacement seal’. We’re to believe the seal was considered tarnished in 1981 and needed to be replaced, though it was only one year old. More suspicious we see the ‘control number’ in the top left corner. It reads ‘5’. The Mint’s directive states, ‘the control number is a series of consecutive numbers assigned to each OJS affixed to a compartment … This number is placed on the OJS and is changed when an OJS is changed’. The seal on Fort Knox 1 had been replaced five times by 1981! Consider that seal 10-J survived for 32 years, as exposed in exhibit 73; this seal survived from 1978 until 2010. Factually, seals can survive for 32 years, but by 1981 the seal on Fort Knox compartment 1 had been replaced five times. Remember we have the audit reports of 1974, 1977, 1980 and 1981; these mention nothing about perpetual re-sealing of compartments. That’s suspicious. Although the control number reads ‘1’ (nothing suspicious about that), we see these 39,026 gold bars were stored in compartment 9 sealed in 1978, after which they were audited and moved to compartment 3 in 1979. The gold was possibly touched one year before it was audited, which is suspicious. A compartment that was re-sealed a few years after it was audited is Fort Knox 8. The reason mentioned on the seal is that a 0.991 fine troy ounce adjustment had to be made. A suspicious explanation. The compartment was sealed in 1986, but previously sealed in 1978. How come a fine troy ounce adjustment had to be made in 1986 on gold that was audited eight years before? By the bye, we have the 1986 audit report; there is nothing mentioned of a compartment that needed to be re-sealed for a fine troy ounce adjustment. This is suspicious. The list goes on and on though it would be too much information to discuss each and every seal individually. Let’s make one more big step. 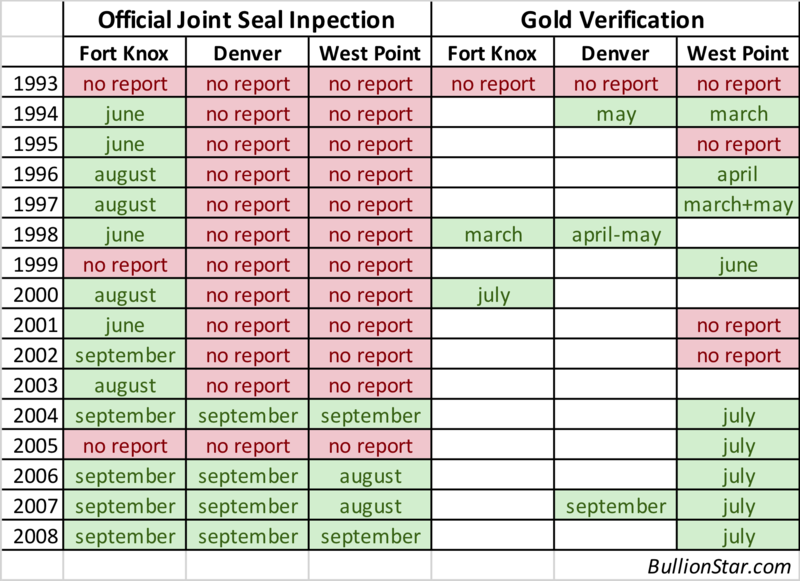 Over at West-Point I read on the seals that five of them, covering 23 million ounces (± 700 tonnes), have been replaced after 1993 but from exactly none of these events did I receive an OJS inspection report (exhibit 48) from the Mint as part of their FOIA response. It’s hard to believe that’s a coincidence. Exhibit 77. This seal was one year old when it was replaced. The few OJS inspection reports the Mint did sent me reveal such procedures were done in one day, at either of the three Mint depositories. It’s impossible that whenever a seal was found tarnished and was replaced all bars in the compartment were counted in one day. So, any re-sealing did not involve counting bars. Now we know Delmar lied to me in his email saying, ‘we observed the counting of 246,203 bars, which equates to 81,638,569 FTOs [since 1993]’, as much of those were actually re-sealing operations, or so it says on the seals. Effectively, some re-audits have been re-sealing operations. In the conclusion we’ll bring order in this chaos of, seemingly, endless re-audits and re-sealing operations. Problem 21) The FRBNY gold audit was 36 years delayed and performed without any independent contractor. Although it was planned in 1975 all US government-owned gold at the FRBNY was to be audited, at the congressional hearing in 2011 we learned it hadn’t been done still. Even after the OIG had the opportunity for many years. At that stage, the Treasury could have hired an independent auditor directly and implement true transparency, but it didn’t. Instead, in 2012 the OIG audited the gold at the Fed, that is, without an independent contractor. You can download the OIG’s audit report here and the assay report here. The committee was made up of staff from Treasury, the Mint, and the Federal Reserve Bank of New York. The annual audits by the committee ended in 1986 after 97 percent of the Government owned gold held by the Mint had been audited and placed under official joint seal. By mentioning how much gold at the Mint was audited he tries to avoid the subject of gold at the FRBNY, which in 2011 had escaped audits for 36 years. Surely the US’ gold at the FRBNY has been used in swaps and leases prior to 2012. Everything but the gold underpinning the world reserve currency is worthy of an audit of the lowest caliber, though remarkably has attracted precisely this. Whilst the function of the audits was to prove the existence of the gold, what they’ve achieved is make us doubt about the existence of the gold. Up to 200 million ounces are stored in compartments that either have been subjected to dubious re-audits or have been re-opened and/or re-sealed for a vast array of other suspicious reasons. The first audit rulebook in my possession states that after compartments were physically verified, ‘these actions, having once been performed by an authorized committee… will not have to be repeated…’ (1975). In a subsequent rulebook it says, ‘the OIG will select compartment(s) to be verified from the population of compartments that have not been previously verified’ (2005). Yet the compartment doors have been re-opened again and again in between, that we know of, 1977 and 2008. Exhibit 79. The rules stated that compartments should have been opened once – we’ve only read about (illogical) revised guidelines from 1983 until 1986. There is just one compartment (Denver 5-J) re-audited prior to 1986 that was not re-opened after that. Meaning all other compartments re-audited from 1983 through 1986 have been re-opened again after 1986. Compartments re-audited by the Mint in between 1987 and 1992 have all been re-opened again after 1992. Roughly 23 out of 82 million ounces re-audited since 1993 have actually been re-sealing operations. An additional 149 million ounces have been subjected to re-sealing operations for dubious reasons, somewhere in between 1977 and 2008. Exhibit 80. Most of the compartments re-audited in between 1983 and 1992 have been re-opened after 1992. 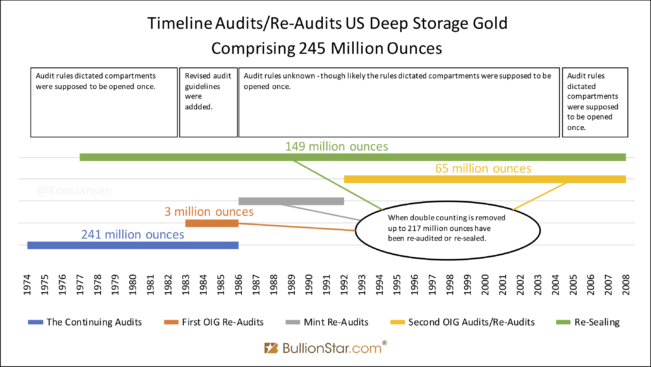 If we strip away double and triple counting, the total amount of gold that enjoyed either dubious re-audits or re-sealing operations is 217,218,864 ounces (6,756 tonnes). Rounded, up to 200 million ounces (± 6,200 tonnes) have possibly been exposed to external threats. I would like to stress this number is an estimate. Most important is the fact this number exists at all. Next, allow me to sum up additional parts of the puzzle discussed throughout this essay regarding the re-opening (re-audit or re-sealing) of compartments and, remarkably, the OIG that has gone to great lengths in order to hide these events. This all is very sensitive to fraud. So many dubious re-opening of compartments, so many lies to cover it. Coincidence? 1. A major level of investigation from both the External and Internal Auditors, fully supported by the Audit committee of the mint, with the following objectives. 1.1 Immediate and in-depth work to determine the level of exposure and the production and implementation of a corrective action plan from the management of the Mint to implement a robust regime of internal control. 1.2 A full and comprehensive audit plan encompassing both external and internal audit resources to ensure that the internal control regime was operating in an effective manner. 2. A deep dive independent investigation to ensure no material loss had resulted from the lapse in Internal control. In my professional opinion, given the information you have unearthed, it would not be unreasonable to expect this to include of FULL audit of the contents of all of the vaults. Of course, some may not agree with this opinion. Surprisingly, this gentleman arrives at the same conclusion as former US Mint Director Edmund C. Moy: there should be a new ‘FULL’ audit authorized by Congress to physically verify the metal. And I agree, as the audits of the US monetary gold severely lack credibility. If we really want to know if there’s gold at US Mint depositories a new audit should be initialized by Congress and executed by a fully independent entity. Until then I remain skeptical about the gold claims by US Treasury. Noteworthy 1) Under special circumstances the Mint has access to the Deep Storage gold. As seen above, the Working Stock owned by the Treasury but usable by the Mint, as literally working stock, is quite large at 2,783,219 ounces (87 tonnes) while prone never to be used in full for numismatic production purposes. On average the Mint has created 1,125,285 ounces (35 tonnes) in gold bullion coins per annum over the past years. Would it be feasible the Mint ever needs all 2,783,219 ounces (87 tonnes) in one year, taking into account metal taken from the Working Stock doesn’t take 12 months to be replenished? Surely, the Working Stock is ample for the Mint’s bullion sales. More important, as if 2,783,219 ounces (87 tonnes) are scanty, ‘upon approval from the Secretary of the Treasury, the United States Mint may use gold from the Deep Storage reserves to support its numismatic operations’ since 1993. 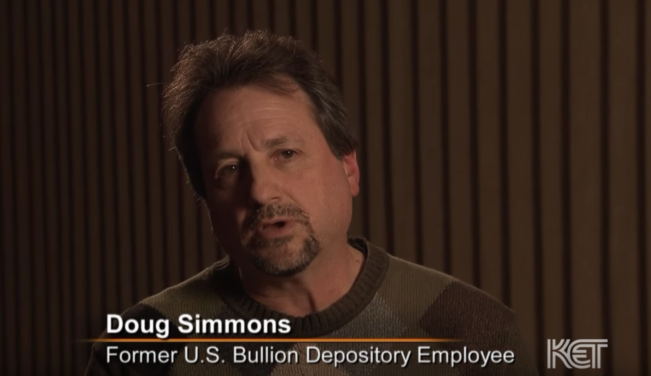 Why would the Mint ever need access to Deep Storage gold for bullion coin operations? Is this a loophole to access Deep Storage metal? Noteworthy 2) All assay reports from The Continuing Audits (1974 – 1986) have been destroyed while tests taken at Fort Knox in 1977 revealed fineness deficiencies. Two sample melts showed the gold was below the fineness (5 parts per 10,000) permitted …. Because of this problem, the vault had to be opened twice more in the presence of the Joint Sealing Committee and the gold reevaluated. On July 29, 1977, bore samples, rather than chips, were taken from the questionable melts and sent to two assay offices for independent evaluations. Half of the samples reassayed were still unacceptable. The Bureau decided that the two melts from which the samples were taken had to be remelted and reassayed. This was done on November 16 and 17, 1977. This time, the gold was within the prescribed level of fineness … discrepancies in fineness were attributed to improper melting and casting of the melts in 1920 and 1921. After the remelting of 2 melts all was fine? Who processed the remelting, the Mint’s New York and San Francisco Assay Offices? It would be extremely convenient if the custodian (Mint) of the US’ monetary gold did the remelting of gold tested when fineness deficiencies surfaced. This way the metal could have easily been supplemented with higher purity gold by the Mint. Noteworthy 3) Nearly all assay test results publicly released are 999.9 fine, whilst the average fineness of all Deep Storage metal is 900.5. 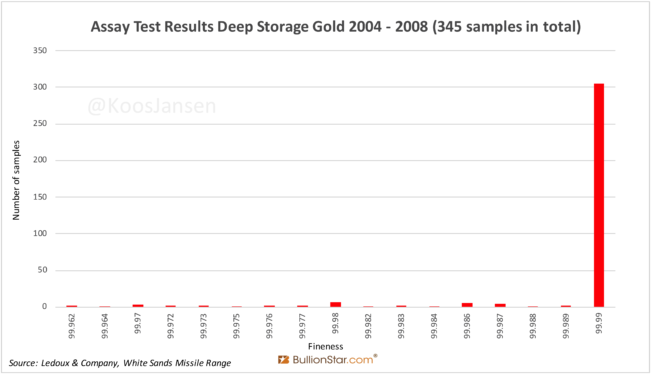 Let us have a look at the average gold purity of all Deep Storage metal, and then of the assay samples taken in 2004, 2005, 2006 and 2008. The vast majority of the Deep Storage gold does not live up to current London Good Delivery standards, which requires gold bars to have a fineness of no less 995 particles per 1000. Most Deep Storage gold is in coin bars having a fineness of about 900 – the average fineness is 900.5 particles per 1000, calculated as total fine troy ounces divided by total gross weight, neglecting the number of bars. The next table prepared by Bron Suchecki shows all bar weights and purities of the Deep Storage gold. In the last column you can see the largest share (73 percent of the bars) is 899 – 916.7 fine. Only 3.56 percent of the bars is 999.9 fine. Exhibit 82. Weights and purities Deep Storage gold. Courtesy Bron Suchecki. The PDF documents released by the OIG in 2011 include assay reports from Ledoux & Company and White Sands Missile Range. When I manually inserted all the outcomes in a spreadsheet it appeared to me that virtually all the assay tests came out as 999.9 fine. A remarkable difference with the average fineness of the Deep Storage metal. Exhibit 83. Purities disclosed are exact read-outs from assay reports. One random Deep Storage bar will most likely be near 900.5 fine, though 305 of the 345 samples taken hit 999.9, and none were below 995. For some reasons the auditors saved all the 99.99 fine gold to be verified for the end. 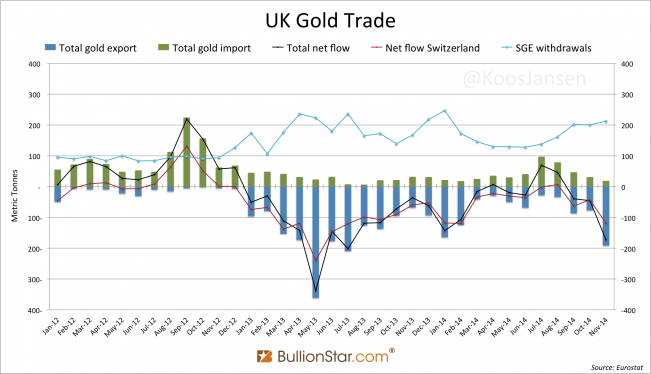 Debunking GFMS’ Gold Demand Statistics SGE Withdrawals 29 MT In Week 16, YTD 635 MT China Continues To Drain Global Gold Inventory Shanghai Gold Exchange Physical Delivery 1750 tons YTD Dutch Central Bank Tight-lipped About Gold Policy How The World Is Being Fooled About Chinese Gold Demand China’s Secret Gold Supplier Is Singapore China Gold Import Jan-Sep 797t. Who’s Supplying? 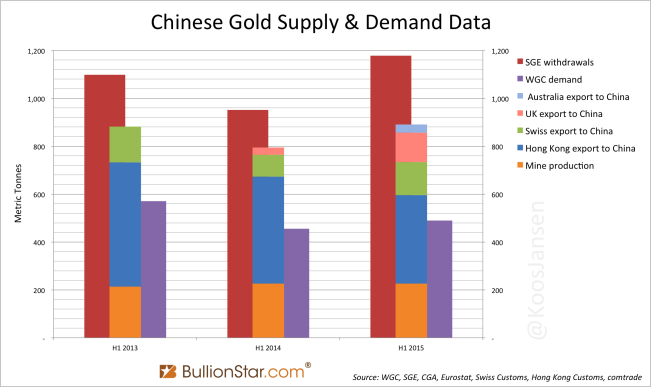 SGE Withdrawals Equal Chinese Gold Demand, Part 3 Why Austria Is Repatriating Gold From London Unprecedented Total Chinese Gold Demand 2013 Audits Of US Monetary Gold Severely Lack Credibility Hong Kong – China gold trade yearly Second Thoughts On US Official Gold Reserves Audits How Much Gold Is China Importing And Does It Still Correlates to SGE Withdrawals?